Anker is one of the best and most popular brands for power banks. However, a lot of confusion exists in the market about correct product timeline and differences in the features of multiple generations of Anker PowerCore II/PowerCore+/PowerCore/Redux/Lite/Astro power banks as well as the correct prices and official sellers on sites such as Amazon. For example, Anker offers seven different models of PowerCore powerbanks in 10000 mAH capacity and another seven types of different PowerCore models in 20000 mAH capacity!! All of these are branded PowerCore II or PowerCore+ or PowerCore and look similar to each other but come with varying features and at similar price-points. Often, customers end up buying old versions of Anker external battery packs at same price as new and better Anker battery packs . Also, many shady sellers on Amazon exploit this confusion to sell old versions of Anker products at high prices. Anker Powercore II 20000 supports fastest charging for latest Android phones such as S9, S8, S7 and gets charged in just 5 hrs compared to 10 hrs taken by PowerCore 20100. The PowerCore Redux series, Lite series, PowerCore II series and PowerCore+ series are the latest Anker series of power banks at present. However, many PowerCore series powerbanks (without the +) and much older Astro series of powerbanks are also currently available in same battery capacities as their Powercore+ or PowerCore II or PowerCore Lite/Redux equivalents. We have created handy tables for your reference below – that are much better than the product tables at Amazon’s product pages – to help you make an informed decision. More recent versions of Anker powerbanks will usually have better charging and device/battery protection technology as well as many additional features. For example, the latest Anker PowerCore II 20000 supports 18-watt fast charging compatible with maximum charging speeds of latest smartphones such as Galaxy S9, S8, S8+, Pixel II etc. It also supports fast input, meaning the powerbank itself can be charged in just 5 hours compared to 10+ hrs taken by by older PowerCore 20100 and Astro E6 battery bank with the same 20000 mAH capacity. An extremely important thing to remember is that AnkerDirect is the only seller authorized for selling Anker power banks on Amazon. A lot of scammer sellers sell Anker portable power packs on Amazon with various misleading names. Many of these fake sellers sell old Anker power banks at higher rates while some sell refurbished or even fake Anker power banks. Buying power banks from such fake sellers will not only cost you higher but will also not allow you to benefit from Anker’s generous 18-month warranty and reliable customer service. There are also very serious accident risks involved with buying fake power banks that use cheap Li ion batteries. At Powerbankguide.com, we give you direct links to buy authorized genuine Anker battery banks that ensure that you get genuine powerbanks at lowest prices and full warranty. Anker has so far released two generations of Astro power banks, followed by multiple versions of PowerCore power banks, again followed by the Powercore+ series as well as the latest PowerCore II series and the 2018 Lite series. As old Astro series and PowerCore series products were not discontinued, this has created a lot of confusion in the market. The existence of all six series of products at once is also sometimes used by some scammers to sell very old (but well-known) versions of Anker power banks and that too at higher prices. Anker is continually releasing new versions of PowerCore powerbanks with some new features that older PowerCores or PowerCore+ do not have! For example, the latest PowerCore II 10000 and the latest PowerCore II 20000 both offer fast charging (50% in 30 minutes) support for Samsung S10, S10+, S9, S8, S7, A9, A8, five-hour charging of the powerbank, and 3 amp charging for latest USB-C phones at almost the same or lower price as older versions. The latest versions also come with better charging chipsets that prevent heating while charging, thereby increasing efficiency and safety. Another similar sounding but less-known powerbank is the PowerCore II 10000 Slim powerbank that also offers 18-watt QuickCharge 2.0 compatible Input and Output for Samsung S10, S10+,S9/Note 9/S8/S7/S6 etc. and is also slimmer and narrower than old versions, thus making it much more pocketable. It is priced almost same as plain vanilla older PowerCore 10000 or PowerCore II 10000! If you are confused about powerbank models and compatibility, PowerCore II 10000 Slim is our favorite all-purpose Anker powerbank as it has perfect balance of portability, light weight, adequate power and speedy charging compatibility for both latest Android phones and iPhones while the powerbank itself can gets charged in just 4 hours. If you want a bigger powerbank (4+ charges for S10/S9/S8/iPhone Xs), you can get all these features in the latest PowerCore II 20000 which comes with fast input charging for charging the powerbank in just 5 hours compared to the minimum 10 hours taken by the older Anker PowerCore 20100. For latest iPhones, the newly released Anker PowerCore 10000 USB-C PD and Powercore Speed 20000 PD will charge your iPhone XS, XS Max, and XR, iPhone X, 8+ or 8 from zero to 50% in just 30 minutes and can be recharged in just 4 hours. Both PowerCore 10000 PD and Powercore Speed 20000 PD support fastest charging for Samsung Galaxy S10, S10+, S9, S9+, S8, S7, Note 8 as well, thereby making it among the most future-proof and best portable chargers available for smartphones. If you own iPhones 7, 7 Plus, 6S etc. that do not support fast-charge, you can choose the much lower priced excellent PowerCore 10000 or Anker PowerCore 20100, which will charge your iPhone 7/6S/5/SE. etc at fastest possible supported speeds (0 to 50% in about 45 minutes). Both will also charge Android phones at 12 watt maximum charging output, which may be slower than USB-C PD or QuickCharge’s 18 watt but is still twice to three times as fast as regular USB wall chargers (5 to 2.5 watt). In mid-2018, Anker released its latest powerbanks – PowerCore Lite 10000 , PowerCore 10000 Redux and PowerCore Lite 20000. All these powerbanks are displayed as newer versions of PowerCore II powerbanks on Amazon. However, even though these powerbanks are more recent launches and look cooler, the Lite or Redux series powerbanks get charged much slowly and also charge Android phones much slowly than the PowerCore II powerbanks. Lite/Redux series portable chargers are also NOT LIGHTER than PowerCore II or PowerCore powerbanks! So we recommend PowerCore II Slim 10000 and PowerCore II 20000 powerbank instead of the “newer” PowerCore Lite 10000, PowerCore 10000 Redux and PowerCore Lite 20000. PowerCore II Slim 10000 (4 hours) and PowerCore II 20000 (5 hours) get charged faster with any Quickcharge 3.0 wall charger or Samsung wall charger for S9/S8/S7 etc while PowerCore Lite/Redux 10000 will take about 8 hrs and PowerCore Lite 20000 will take about 12 hrs to charge. PowerCore II Slim 10000 and PowerCore II 20000 can deliver 18-watt maximum output and can therefore fast-charge latest Android phones including Samsung S9, S8, S7, Note 9, Note 8 etc. at max possible speed while PowerCore Lite 10000 and PowerCore Lite 20000 (12-watt max) cannot do this. iPhone XS, XS Max, XR, X, iPhone 8/8+ and iPad Pro support USB-C PD and can be fast- charged 0 to 50% in 30 mins only using these three Anker USB-C PD powerbanks – Anker 10000 USB-C PD, PowerCore Speed 20000 PD or PowerCore 26800 PD. Bet for Quickcharge 3.0 compatible phones such as HTC U11, LG V30, Sony XZ1 etc. Gets charged in 5 hrs Obsolete. PowerCore 2000 PD is a far better buy and available at less price. Hello. This is THE most informative site that I have found, so thanks. After reading I am trying to decide which lightweight PowerCore would be best to keep my Samsung A5 going while I trek for 4 days in Peru. The Anker PowerCore 13000, the Anker PowerCore 15000Redux or the Ravpower 16750? If the Anker 13000 would there be any advantage in the type C please? I expect to use the phone as a camera rather than as a phone while trekking. Weight is quite important. Hi Judith, Among the powerbanks that you have mentioned, Anker PowerCore 15000 Redux is offers the maximum battery capacity for minimum weight. However, the advantage of Anker 13000 with USB-C Input is that you will be able to directly plug-in your Samsung A5 phone’s charger with its USB-C cable into your powerbank to charge it. This is convenient while travelling, as otherwise you will have to switch cables everytime you want to charge the powerbank/phone. All things considered, we think Anker 13000 with USB-C Input will be the best choice for your Samsung A5 both weight-wise and convenience wise. Do you consider the power banks I mentioned the best for power/weight ratio or should I consider anything else? Hi Judith, The powerbanks listed by you are excellent weight/capacity wise and offer good balance of good capacity at manageable weight. However, their only drawback is that they take ages (about 11-13 hours minimum) to recharge. We will therefore recommend considering an ultra-light fast-charging powerbank such as Anker PowerCore II 10000 (6.9 oz) while travelling. It will give you more than two full recharges for the Samsung A5 and will allow you to quickly fully-charge the powerbank in under 4 hours and to also quickly top-up the phone (or the power bank) during rest-stops while travelling. PowerCore II 10000 charges your Samsung A5 as fast as the wall-charger and this is very handy during travel. Sounds good, I’ll take a look at that. Sounds good, I’ll take a look at that one. I bought a Power Core 20100 on December 25, 2018. I needed it for charging my Panasonic Lumix G9 camera while on a shoot. It does a great job when the camera is turned off. But I bought this power core because I was needing it to charge the camera WHILE I am shooting. Why won’t it do this? And if it won’t, what charger do you know of that will? And can I exchange this model for that model? Hi Cia, The limitation here is NOT in the powerbank but in your camera’s battery-charging system. Cameras have very high current draw (can be as high as 10-20 amps! for flash) while shooting and hence for safety reasons and to extend battery life, most manufacturers disable charging of the battery while the camera is being used. A good solution is to buy an extra battery pack for the Lumix G9 along with the Panasonic Lumix battery charger. This charger has micro-USB input and will enable you to charge the extra battery with your PowerCore 20100 while out in the field. So i’m choosing a power bank for my iPhone X and im stuck between the powercore II Slim 10000 and the powercore II 10000. Is the only difference between those two the shape of the powerbank? and are they the best option for me? I’m not looking for fast charging so I dont want the new PD powerbank. Hi Bashar, Besides shape and minor difference in weight, the other big difference is that PowerCore II Slim 10000 uses Li-Po internal batteries while PowerCore II 10000 uses Li-ion batteries. The real-world differences between the two are minor. Overall, you can say that PowerCore II Slim 10000 is slightly more robust but heavier than PowerCore II 10000. For iPhone X, you can choose any of the two and get similar performance. If you want robustness and pocketability, you can choose choose PowerCore II Slim 10000 for its slightly better robustness and ergonomics. However, if you want lighter weight and convenience of 10-point battery-status indicator and do not mind the squarish chunky shape, then PowerCore II 10000 is a good choice. Hello I am looking for a the best portable charger that is capable with the Samsung galaxy note 9 and Iphone X, with two usb ports? If possible one that has 3 usb ports and a good anker wall charger? Thank you. Hi Annie, Anker PowerCore 10000 PD has two USB output ports and will fast-charge both Samsung Note 9 and iPhone X. It can also charge both iPhone X and Samsung Note 9 simultaneously as well. We recommend Anker PowerPort II 49.5Watt wall charger for your Note 9+iPhoneX+ PowerCore 10000 PD combination due to its high output that can handle two devices at max charging speeds at once. This wall charger will also charge powerbank fully in 3.5 hrs and also fast-charge iPhone X zero to 50% in 30 mins when required. If you require 3 charging ports, the best Anker powerbank for your device combination is PowerCore 26800 PD. It is a bit heavy at 1lb but is the best solution with 3 ports and also comes with a bundled PD wall charger. Not Anker, but an even better 3-charging port portable charger will be RAVPower 26800 PD + Anker PowerPort II 49.5Watt wall charger. Anker PowerCore 10000 PD will charge your Note9 & iPhone X once each while 26800 mah powerbanks will fully charge Note 9 two times + iPhone X three times. May I know what power bank I should purchase? I have an iPhone X and an Air Pad 2 which I will be bringing and using extensively while traveling in the next couple of weeks. I have been considering buying the Anker Power Core Speed 20000 PD based on your recommendations which I have read here. Is this the best option for me? This unit comes with a wall charger. Can this charger also be used to charge my iPhone X and iPad Air 2? Do I understand it correctly that I will need to use the lightning cables of my iPhone X and iPad Air 2 to connect to the Power Bank? And lastly, will the airlines allow me to bring this Power Bank inside the plane? Please let me know if you are recommending another model/brand of Power Bank for me to consider. Thank you very much for assisting this non-techie in my decision on which Power Bank to purchase. – Yes, PowerCore Speed 20000 PD is the best option considering your device-mix. – You will need to buy an Apple USB-C to Lightning cable to charge your iPhone X with the wall charger/powerbank. – Yes, It will be allowed on all airlines worldwide including US/European airlines as 20000mAH = about 72wh and this falls well under the maximum 100WH limit specified by the TSA for powerbanks in the carry-on/cabin luggage . Which one of the power banks would be best for my needs? Hi Lee, Both Huawei Mate 20 Pro and Nintendo Switch support USB-C PD fast charging, so the best option will be a USB-C PD powerbank. Anker has 3 USB-C PD powerbanks – PowerCore 10000 PD, PowerCore 20000 PD, and PowerCore 26800 PD. As you will be carrying at least two large battery devices, we recommend eithr the PowerCore 20000 PD (13.5 oz) or the PowerCore 26800 PD (1lb). Thanks! Going on a Holiday to Ireland for 10 days and need a power bank for this and future travel. I am not tech savvy at all. The wife and I have new iPhone Xs each. Should I get a power bank for each of us or just one? I don’t suspect we will ever be away from wall power for more than a day at a time. We have new MacBooks as well but don’t anticipate ever charging them this way. Possibility of charging an iPad on a bus or plane. Looking for best combination of size, weight, speed, etc. that I can find. I have researched until my head hurts. Suggestions? Also, I have a Samsung S8 wall charger and cord that came with another phone we had temporarily. Is that one of these quick chargers that is being discussed? Hi Mark, We think that one 20000 mAh capacity powerbank will be adequate for your charging requirements. As you already have new Macbooks that come with USB-C PD wall chargers and iPhone XS supports USB-C PD charging, we think that a USB-C PD powerbank will be an excellent future-proof choice as it will offer full compatibility with all your devices and also offer fastest possible charging. Our top recommendations for your specific charging requirements are however not from Anker. We recommend Zendure A6PD 20100 or RAVPower 20100 PD 45 watt powerbanks. Out of these these two, we prefer the Zendure A6PD 20100 (13.5 oz) as it is about 1 oz lighter and more compact. Both these powerbanks will get charged in just 3.5 hours using your Macbook charger (one no longer need to pack a separate charger for powerbank). With any of these two powerbanks, you will be able to take advantage of the fast-charging feature of iPhone Xs which lets you charge iPhone Xs from zero to 50% in 30 minutes. Either Zendure A6PD 20100 or RAVPower 20100 PD 45 watt will charge iPhone Xs about 5 times which gives adequate margin for peace of mind while travelling. To charge the iPhone Xs from USB-C PD powerbanks that we have recommended, all you need is a Anker USB-C to Lightning cable or the Apple USB-C to Lightning cable. Another great benefit of buying USB-C to Lightning cables is that you can use them to fast-charge (0 to 50% in 30 min) your iPhone Xs from your Macbook chargers. We are not recommending Anker’s excellent PowerCore 20000 PD powerbank as it comes bundled with a wall-charger, which you do not require as you already have two Macbooks chargers. Please feel free to send us any further queries or if you seek any clarification regarding our recommendations. If I never plan to charge the Macbooks do you still feel the same way? Yes, Even if you do not charge the Macbooks, USB-C PD powerbanks are a much better choice for your device mix. With a USB-C PD powerbank, you can charge the iPhone Xs in half the time taken by regular powerbanks and carry along one less charger with you. Also, the powerbank gets charged much faster (3.5 hrs as compared to minimum 6 hrs). The next best alternative after a USB-C powerbank is Anker PowerCore II 20000 . This weighs (14 oz) and costs same as a USB-C PD powerbank, will get charged in 6 hours using the S8 charger, and charge iPhone Xs 0 to 60% in about one hour. It will also provide 5 full charges for iPhone Xs. Also, the reason we have not suggested any 10000 mAh USB-C PD powerbank (such as Anker’s new PowerCore 10000 PD which also gets charged with Macbook chargers) is that you have two large battery phones and an iPad, and while travelling, a 10000 mAh powerbank will only charge the iPhone Xs once each (2.5 times in all) leaving no margin in case you get stuck somewhere or forget to recharge your powerbank. I took your advice and purchased the Zendure unit. Hopefully you can answer a question as Zendure has been quiet. Should’t any USB-C cable work? I have a brand new 2018 Mac Air and I used the plug and cable from that to try and charge the power bank for the first time and nothing happened. I switched to the cable included with the unit and it charged. Am I missing something? I thought part of the idea of USB-C was to eliminate some cables. Please help. Also, I got one of the new Anker 10000 USB-C PD units to carry in my backpack every day for work and love it! Would not have known about it if not for your article. Thanks!!! Hi Mark, In theory, all USB-C cables are supposed to be replaceable with each other, however in practice this is not always the case. For example, Samsung S9/S9+ are very picky and often get fast-charged only with their own USB-C cables! Apple cables especially do not always play well with other devices and this seems to be the situation in your case. The implementation of the USB-C standard is not uniform among even the most reputed manufacturers at present…though things are improving gradually! Could you suggest the best powerbank. Also what kind of wall charger do I need to charge the powerbank? For charging these 4 devices, we recommend a minimum 20,000 mAH powerbank. We suggest Anker PowerCore II 20000 as it will charge your both phones (Galaxy S7 Edge, J3 Star) and the tablets at fastest possible speeds. The powerbank can also be recharged very quickly in just 5 hours. We recommend Anker Powerport 2 Dual port wall charger for charging the powerbank. PowerCore II 20000 will charge all your four devices from 15% to 100% once each. If you need more capacity and are OK with 3 oz more weight and much larger size, then Anker PowerCore+ 26800 is the next suggestion. It comes bundled with its own fast-charger and will give you 35% more battery capacity at same price – one extra charge (15% to 100%) each for your S7 Edge and J3. Thanks! P.S. The two Galaxy Tab 4s T337A have quite large batteries (4450 mah + 4450 mah) while the phones are 3600 mah (S7) & 2600 mah (J3). Thank you so much for this information. You have taken away so much guesswork and worry about possibly harming one of my devices. Does the Powercore II 10000 also have the 2.4 amp rapid charge of the same spec as the Powercore 10000. The 0 to 50% in about 30min? Hi Sean, Powercore II 10000 has much faster recharge capability than PowerCore 10000. By using a Quickcharge wall charger or wall chargers that come with Samsung Galaxy/Note/A/J phones, PowerCore II 10000 powerbank can be recharged in just 5 hours. If you only have a 2.4 amp wall charger the PowerCore II 10000 will get recharged at same speed as PowerCore 10000 (8-9 hrs). Hi Edison, For your specific charging requirements and budget, we recommend Anker PowerCore Speed 20000 PD. This will give you a terrific future proof USB-C PD powerbank that can fast-charge S9+ and get charged in just 4 hours. We will recommend avoiding the Anker 10000 Redux powerbank. Instead, for the Galaxy S7 (or S8/S9 or any other phones), PowerCore II 10000 Slim is a much better powerbank. PowerCore II 10000 Slim charges S7/S8/S9 almost twice as quickly and also gets charged much faster than the Redux 10000. As you mentioned, the half oz weight advantage of Redux is very minor and not worth its way slower charging/recharging speeds. Regarding wall charger, we will recommend the Anker Powerport Speed II. It can fast-charge both the PowerCore II 10000 and S7/S8/S9 at fastest speeds simultaneously and has an excellent build quality and power output characteristics. I am looking for an Anker branded charger for the nintendo switch specifically and was wondering out of all high-capacity (20000+) Anker chargers available, which is currently the absolute best for the nintendo switch? Also, i don’t believe AnkerDirectAU sell the bundles that come with the wall chargers as seen here: Anker-PowerCore-26800mAh so keep that in mind when giving your reccomendation. Weight is not an issue, just the charging speed of the powercore itself and the switch either when not being used or playing while charging. Fantastic comparison between chargers nonetheless! Keep it up power experts! Hi Andre, For charging the Nintendo Switch while playing(as well as for fast-charging latest iPhones Xs/Max/8 and latest Androids etc. ), we will highly recommend Anker PowerCore Speed 20000 PD. It is currently available at a huge discount on its regular price due to the festival season. Besides charging the Switch, it is also an excellent all-rounder powerbank that gets charged in just 4 hours offers best-in-class battery/weight-size ratio. AnkerDirect Australia (AnkerDirectAU) does not currently sell powerbank+wall-charger bundles at present. Also, PowerCore Speed 20000 PD is not available in Australia. For buyers in Australia, our best picks in USB-PD powerbanks (for Switch/new iPhones and latest Androids) currently are the RAVPower 26800 PD and Zendure A6PD 20000 mAH powerbanks. Hi, there – Love the info! I’m looking for a portable charger for my nintendo switch, and other things on the go. I’ve heard the Anker Powercore + PD 26800 is the best bang for my buck. May I have your thoughts on this? Or, any other suggestions? Hi Kaz, Powercore+ PD 26800 is a great powerbank and is available during the festival season at a very decent price. If you are willing to look beyond Anker, then you can get similar battery capacity/weight/quality at a slightly lower price as well. We think RAVPower 26800 PD gives the most bang for your bucks (battery capacity per dollar)! It can be combined with Anker’s newly released excellent PowerPort II 49.5-watt PD wall charger for charging the powerbank in 4 hrs. This combo gives you an extra port on wall charger for fast-charging any modern smartphone as well. If you already have a PD wall-charger, then ZMI 20000 PD and Zendure 20000 PD are other two excellent quality value-for-money PD powerbanks for the Nintendo Switch. However, if you need to buy a PD wall charger as well, then Anker’s PowerCore Speed 20000 is available in December 2018 till Xmas at an excellent price and is currently the best powerbank + wallcharger deal in medium/high capacity USB-C PD powerbanks. Hi I would like a suggestion on the most suitable anker power bank for a mate 10 pro. I am looking for either 20000 mah or 26800 mah for travel with the quickest charge speed and then lightness, efficiency and price after that as other factors. Finding it hard to understand which models are best for Huawei mate 10 pro. Hi Jordan, Huawei Mate 10 pro uses Huawei’s proprietary SuperCharge charging technology. Good news is that SuperCharge is fully compatible with both QuickCharge and USB PD. This means you can use either Anker PowerCore Speed 20000 (Quickcharge 3.0) or Anker PowerCore Speed 20000 PD (USB-C PD) as fast-charging and light powerbanks with high efficiency for your Huawei Mate 10 Pro. Hi, You have a amazing site! Would you please help me to choose what would be the best for us! We will be trekking in Zanskar (my wife and our 3 teenagers) and I would like to buy a solar panel and a power bank. We will need to charge 2-3 batteries (Camera… Olympus BLH-1 and Panasonic G80) each day for a total of 6 to 7000 mAh. Hi Laurent, Thanks for the appreciative words!. Charging with portable solar panels is very different from regular powerbank charging/recharging. Our tried and tested go-to recommendation for charging with portable solar panels is Easyacc dual-input powerbanks. We highly recommend EasyAcc 20000 or EasyAcc 26000 for charging with a portable solar charger such as Anker Powerport Solar Lite. Thanks! Well… I am really concern about weight…! EasyAcc 2000 is about 16 oz… and the power core II 20000 is about 11,5 oz. Is there a so big difference between the 2 that I carry 5 oz more for days… multiply by 10 little things… at the end of the day it can make a big difference… but in other way if the power bank does not the job… (I will be using powertport solar 2 (21w)). I would like to buy the “best power bank” to use with the Anker Powertport Solar 2 but the lightest possible !! Hi Laurent, The weight difference between the two is not that much as weight listed on the Amazon Product Info section of Powercore II 20000 listing is incorrect – PowerCore II 20000 weighs about 13.2 oz in real. We will absolutely recommend PowerCore II 20000 over Easyacc 20000 if solar charging was not a factor. However, the reliability of Easyacc 20000 for solar charging is what makes us recommend it over PowerCore II 20000 for your specific charging requirements. Thanks!. Thank you very much for your recommandation !! I will get the Easyacc ! If I want a second power bank… in case one would have a problem… do you recommend EasyAcc 10000? Hi Laurent, EasyAcc Slim 10000 is a good and light powerbank but we have never tested it ourselves with solar panels. Hence, we are more confident about recommending either PowerCore II 10000 or PowerCore 10000 as good alternate choices. Both offer incredible power/weight ratio and are well compatible with portable solar panels. The only significant advantage of PowerCore II 10000 is that it will take about half the time (4 hours) to fully recharge via a Quickcharge wall charger whenever a wall outlet becomes available. Thanks! Hi, Amazingly informative page. Just one small question to make sure! Here are six best powerbanks in the market that can charge iPhone Xs/Xs Max/X/Xr/8/+ fastest (50% in 30 mins) and also get charged in minimum time possible. Best for iPhone + Frequent Macbook charging Zendure 20000 PD – Pros – Gets charged in 4 hrs, Best-in-class 45-watt fast charging for Macbooks, Full Quickcharge 3.0 support for Samsungs/Android, Excellent quality, -Cons– Pricey. To charge it fastest, you have to buy a fast PD wall charger separately or use Macbook USB-C wall charger. Thank you! Really helpful, think I’ll go with the Anker PowerCore Speed 20000 PD as it seems to suit exactly what I need. Thanks again! You have a amazing site! Would you please help me to choose between Anker Power core 20.000 PD, and Anker Power core II Slim 10.000? Amazon does not send the first one to The Netherlands. A friend of mine stays currently in the US and he can carry it in his hand baggage. It will be used for charging a Samsung S8+ and maybe a Surface. Hi Anne, Thanks for the kind words! For primarily charging the Samsung S8+. we will recommend the Anker PowerCore II Slim 10000. You will get two full recharges for S8+ at fastest possible speed and have a very handy, slim, and lightweight powerbank that gets charged very fast as well. While PowerCore 20000 PD is a great charger, its size/weight/price/PD capability is justified only if you have one of the newer iPhones (XS Max, Xs, Xr, X/8/8+) or you need to also charge a Macbook occasionally. I’m sorry to bother you again, but I have more questions! I suspect from the picture that it doesn’t come with a cable. Am I right? Which kind of cable do you advice to add to my order? I only see USB cables and no cable to charge the power bank from the wall. Is that not necessary? Or am I supposed to use my mobile’s cable? Do I need a travel shell too? Which one do you recommend? Thank you in advice for replying my questions. Hi Anne, You need not buy a second wall charger for the powerbank. The PowerCore Slim 10000 powerbank comes with a micro-USB cable in the package. You can connect this micro-USB cable with the wall charger of your Samsung S8+ and charge your powerbank quickly using it in 5 hours. If you prefer, then you can buy a dual-port quickcharge wall charger such as Anker QuickCharge Dual wall charger and use it to fast charge both your S8+ and the PowerCore Slim 10000 simultaneously from the same wall charger. You do not really need a shell for the powerbank keeping it safe. However, if you want to buy a shell to keep your powerbank/cables organized, then Hermitshell Hard EVA case for PowerCore Slim 10000 is the best one available. Thanks and please feel free to ask further queries in case there is any confusion. Thank you so much for this information. Are you sure this wall charger does work here in Europe? Anker wall chargers bought from US work fine with European voltages (220-240V/50 Hz) but require a European wall-plug adapter to use. For use in Europe, it is better to buy a wall-charger with European-style pins. A good recommended wall charger is UGreen Dual Wall charger. This is available on Amazon Germany and also ships to the Netherlands as well. In fact, you can also buy PowerCore Slim 10000 from Amazon Germany , which is also available for shipping to the Netherlands. Hi Elena, PowerCore II 6700 is a good lightweight powerbank for iPhone XR and offers reasonably fast 2amp charging. Most other lightweight powerbanks will not offer any significant charging time advantage for the iPhone XR. However, if you are interested in fast-charging the XR from 0 to 50% in just 30 minutes then you can consider the Zendure Ultra-Slim 10000 PD. It does cost a bit higher but offers 2X full charges for the iPhone XR, almost twice as fast charging for XR compared to PowerCore II 6700, and weighs about same as PowerCore II 6700. I’m using an iPhone SE and looking for an Anker powerbank suitable for my phone. I’d like to charge both my phone and the powerbank as fast as possible. Besides that, as I travel quite often, I prefer a lightweight powerbank. Which Anker powerbank would you suggest? Also, I’m living in Finland, where the standard voltage is 230 V and the frequency is 50Hz. Do I need to purchase an additional adapter to use with the Anker powerbank? As in Finland there are no authorized sellers of Anker powerbanks, and AnkerDirect on Amazon does not ship the products to Finland as well, can I purchase Anker powerbanks on eBay instead? Or could you please suggest me any website that I can purchase genuine Anker powerbanks to ship it to Finland? Most modern wall chargers, including all Anker wall chargers, can handle 230 volts fine and you do not need any other power adapter to charge Anker powerbanks. As an example, Anker PowerPort+1 wall charger can accept 100 – 240 volts and 50-60 HZ AC. Shipping to Finland is a bit of problem even from marketplaces in the EU. While there are many good Anker powerbanks that meet your criteria, we are only going to recommend a powerbank that is available from the official seller on Ebay as you requested. You can buy Anker PowerCore 1000 Speed on Ebay from the official seller AnkerDirect . This portable charger gets charged very fast and charges iPhone SE at maximum speed . Using a QC 3.0 wall charger such as Anker 31.5W Dual USB Wall Charger PowerPort 2 with Quick Charge 3.0 (also available on Ebay from ankerdirect), you can charge the PowerCore 10000 Speed in about 4.5 hrs. Thanks so much for your suggestion! I’m considering between Anker Powercore II 10000 mAh Slim and the model that you suggested. I love the design of Anker Powercore II 10000 Slim, but I don’t know which model better suits my iPhone SE? Please advise. Thanks in advance! PowerCore II 10000 Slim perfectly suits iPhone SE as it supports the fastest charging mode (2.1 amps) of iPhone SE and will give you almost 4 full recharges for your iPhone SE. Thanks! Hello! Very useful information, thank you!! I am from Lithuania and going to remotest parts of Africa: CAR, Congo jungles etc. I will stay very often without electricity for a week or longer and want to make a lot of video with my phone. On my trip I will need to charge Galaxy Note 9 (or iPhone xs), iPad 6th gen., DJI Osmo Mobile-2 stabilizer. I am thinking to buy Anker PowerPort 21W (?) and 2 power banks: Anker PowerCore II 20000 (?) and one with bigger capacity, maybe 26800. One of the power banks could be with USB-C for future trips. For a wall charger, I am thinking about Anker PowerPort II PD dual port. Maybe you could suggest me what to buy for such type of journey? Weight and power bank max capacity, speed are very important. A light portable solar charging pack. Anker PowerPort 21W or Anker PowerPort Lite 15W are good choices. If they are not available (or are priced too high), then Aukey 21 Watt solar charger or Nekteck 21 W are good (but slightly heavier) alternatives. Two solar charging compatible high-capacity powerbanks. We recommend RAVPower 26800 USB-C PD , EasyAcc 26000, or Anker PowerCore II 20000 – > all of these are good solar charging compatible recommended powerbanks. RAVPower 26800 USB-C PD is more versatile and future proof as it offers USB-C PD charging. EasyAcc 26000 is the plain vanilla no-frills option with excellent solar charging compatibility. Anker PowerCore II 20000 is a good (and lighter) option which will allow fast charging feature for your Samsung Galaxy Note 9 and rapid recharge of powerbank when power is available. Important Note #1: Anker’s PD powerbanks – PowerCore 20000 Speed PD and PowerCore 26800 PD give unusually slow charging speeds on solar charging. Similarly, Anker PowerCore 26800 (non-PD version) has a hit and miss solar charging compatibility. Important Note #2 : When in a remote area, avoid fast-charging your phones (i.e. charge only using non-fast charging ports only) from the powerbank to maximize the battery capacity of your powerbanks. Fast charging uses higher voltages and wastes powerbank capacity. Anker PowerPort II PD is an excellent choice as a wall charger with its combaination of 1 USB-C PD port + one Quickcharge 3.0 port . It will fast charge any of the three recommended powerbanks as well as your Note 9, iPhone Xs, or iPad 6 gen.
Can’t understand this is RAVPower 26800 USB-C PD or similar model? Hi Danas, The link you sent IS NOT the RAVPower 26800 USB-C PD. It is the non-PD 26800 mAH USB-C powerbank from RAVPower. Here is the link to RAVPower 26800 USB-C PD portable charger that we recommend. Here is the Amazon Germany link to RAVPower 26800 USB-C PD powerbank. Fantastic information thanks. We are just getting new phones, iPhone 8 and HTC u11. I was looking at an Anker Powercore 20000 PD but then read on one site ‘not compatible with HTC 10’. I can’t find anything about the HTC 11. Also appreciate your info about alternatives in Australia (where we live) and Nepal (where we’re going)! Thanks for the appreciative words! 🙂 HTC U11 supports USB Power Delivery and Anker Powercore Speed 20000 PD will fast-charge both the HTC U11 and the iPhone 8 fine. For Australia, Zendure A6PD 20000 mAH is an excellent alternative to Anker PowerCore 20000 PD. High-end PD powerbanks are not easily available in Nepal (or India) and the ones that are available are priced way higher than their original price in US/Europe/Australia. Hence, it is better to buy a PD powerbank before travelling to the region. The best powerbanks you can find at reasonable price in Nepal/India are Xiaomi powerbanks. Mi Powerbank 20000 mAH will fast-charge the HTC U11 (but not the iPhone 8). Hello, Great reviews of the Anker power banks! I currently have a Macbook Air, an iPhone 7+ and an iPad Air 2. I’m buying the new 13 inch Macbook Pro soon and I’m having some difficulties in choosing a good power bank. I usually charge my devices during the night and I want a power bank which is atleast 20000mAh and that charges my devices fast. What do you suggest? According to reviews, I’m leaning towards the Powercore II 20000 or the PowerCore+ 26800 PD. What’s the difference between the two? And lastly, what’s the best wall charger to use with them? And how do they compare with let’s say an iphone charger. Anker PowerCore+ 26800 PD is the better choice as it has 30 watt USB PD output. You will require the USB C PD output to charge Macbook Pro 13 at decent speed. PowerCore II 20000 does not have PD output and will not be a good choice for charging Macbooks. Another benefit of PD output is that you will be able to fast-charge new iPhone XS,XR/XS Max/X/8/8+ from 0 to 50% in 30 mins. Anker PowerCore+ 26800 PD comes bundled with its own PD wall charger which will charge it in 4 hrs and you do not need to buy require any other wall charger. If you have require occasional power backup for your Macbook Air, then a PD powerbank such as Anker PowerCore Speed 20000 PD is a better choice. It can fully recharge Macbook Air battery almost once at a pretty decent charging speed. Besides this, it can also fast-charge all latest and upcoming iPhones (8/8 Plus,X, Xs,Xr,Xs Max) 50% in 30 mins. Anker PowerCore Speed 20000 PD also gets recharged in just 4 hrs with the included wall charger. Anker Powercore II 20000 or the Powercore+ 26800 portable chargers are best suited to Samsung Galaxy series (S9/S8/S7/S6 and Note 9/8) phones or other Android phones as they can fast-charge these phones. For Apple iPhones/iPads, Powercore II 20000 or the Powercore+ 26800 will not give you any useful feature for charging Macbook Air or iPhones. The only benefit of Powercore II 20000 or the Powercore+ 26800 (for iPhones) is that the powerbanks get charged in about 6-7 hours with a Quickcharge 3.0 wall charger. Which would be better? How long will each charge in a 1 amp charger? Both PowerCore II 10000 and PowerCore 13000 will charge iPhone XR, X, 8, Xs, XS Max etc at the same speed. Neither of these two powerbanks supports the fast charging mode (18w PD) supported by Apple iPhone XS 8, 8 X, Xr etc. The only Anker powerbanks that can fast charge new Apple iPhones Xs/8 etc. are Anker PowerCore Speed 20000 PD or PowerCore 26800 PD. Using a 1 amp charger, it will take about 11-12 hours to charge Anker II 10000 and about 14 hours to charge PowerCore 13000. Hence, it is best to use a QC wall charger for Powercore II 10000 (4 hours) and a good 2.4 Amp USB wall charger for PowerCore 13000 (6 hours charging). Thanks for helping. Well i want to stay under $40…and I am fine with a USB so which should I get? Has to have at least 12w or 2.4 amps. For iPhones, Anker PowerCore 13000 is the better option if the total budget for powerbank + wall charger is limited to under $50. A top-end dual 2.4 amp wall charger such as Anker Elite dual Port 24W for PowerCore 13000 will cost you almost $20 less than a dual QC3.0 wall charger. This makes the overall powerbank + wall charger package much better value when compared to PowerCore II 10000. The only benefit of PowerCore II 10000 while charging iPhones is 4 hrs recharging time and 1 oz less weight. Anker PowerCore 13000 will get charged in 6+ hrs from the 2.4 amp dual port wall charger, which is still pretty good charging time. PowerCore 13000 also gives you 30% extra capacity than PowerCore II 10000 (one full charge for iPhone 7) + an extra port while costing almost same and weighing just slightly more (less than 1 oz/30gm extra). Hi Great site. Very impressive. Looking to get a battery probably the Power Core II 20000 as have previously run out of battery with the 13500 before. Need the battery to charge quickly, as in town sometimes for limited time before back on trail and probably need to charge 2 phones and perhaps a camera battery as well as power core when in town. So looking to see what would be the best wall charger to go with the battery. The weight is a consideration. Thanks for considering the request. A good dual-port wall charger with atleast one QC 3.0 port is the minimum lightest weight suggestion for your charging requirements. We recommend Anker Powerport Speed 2 dual wall charger (4.6 oz/130 gm)). It will charge PowerCore II 20000 in fastest time and also fast charge any Android phone from the other port. For 1.2 oz extra weight (5.8 oz or 160 gm), you will get one more charging port (3 ports in all) with the 42 watt Powerport wall charger for charging three devices at once. Great site and very useful information you have compiled. I do have several questions and am having trouble narrowing down which powerbank to choose. I will be hiking for several days and typically use my phone (Galaxy S6) as my camera and the battery itself isn’t very good. I’m hoping to upgrade when the new Galaxy 10 comes out next year. Anyways I’m looking for a 20000+ powerbank that has a quick charge for the S6 and an Iphone X. What wall charger would provide a quick charge for the powerbank and while it’s charging from the wall can I use the powerbank to charge the phones simultaneously? Of course I’d like something on the lighter side as I’ll be carrying everything I need for the hike. How often do new Anker powerbanks come out? For your specific requirements, we recommend Anker PowerCore Speed 20000 PD. It is the lightest (13.5 oz/360gm) good quality 20000 mAh+ PD powerbank in the market capable of fast charging both latest Samsung phones (S9/S8/S7/S6 and S10 in future as well) and the latest iPhones including XS Max, XS, X etc. Anker PowerCore Speed 20000 PD comes bundled with a PD fast-charging wall charger for 4-hour powerbank charging. The bundled wall charger will also quickcharge latest Samsung phones and fast-charge iPhone XS, XS Max etc. If you still need a standalone wall charger, we will recommend Anker PowerPort II PD dual port wall charger. Powerport II PD will charge the Anker PowerCore Speed 20000 PD at the fastest speed in 4 hours and also has a spare port to Quickcharge the Samsung S6/S7/S8/S9 at the same time. Most powerbanks including Anker PowerCore Speed 20000 PD do not support charging devices from the powerbank when the powerbank itself is charging (called pass-through charging) as it can seriously degrade battery life. Instead, using a dual port wall charger will allow you to fast-charge both phone and powerbank from a single AC outlet. In case you absolutely need pass-through charging, then we will recommend the Zendure A6 USB PD 20000 mAH powerbank. It has all the quickcharging features of Anker 20000 PD for Samsung S9/S8/S7/S6 and iPhone XS Max, X etc. and also supports pass-through charging. Zendure service and build-quality is very well comparable to Anker and RAVPower. To answer your last query, Anker usually releases new powerbank models in summer/fall. Newly released models are not always superior to existing models. For example, the new 2018 released launches, in fact, do not support Quickcharge or Apple fast-charge or fast powerbank charging at all. Thank you very much for that response! I purchased the Anker PowerCore Speed 20000 PD w/ wall charger based on your recommendation. Please help. Lot’s of great info and I’m on the fence – I’m trekking to Mt. Everest Base camp. Power is unreliable in the tea houses and I plan to solar charging panels. The devices I will want to charge daily – iPad Pro and apple watch. As needed my iPhone X. I need the lightest weight and still effective portable charger. What do you recommend and do I purchase from this link? Thank you for any direction you can provide. We will recommend RAVPower 26800 PD powerbank (1 pound/450gm) with Anker Powerport 2 PD wall charger for charging (iPad Pro and iPhone X) at teahouses and charging using a solar charger for the Everest Base Camp trek. RAVPower 26800 PD powerbank will charge your iPad Pro 20% to 100% twice + fully charge your iPhone X once on a single charge. Apple Watch requires very less power to charge and hence we are ignoring it. If RAVPower 26800 at 1 pound/450 gm weight seems too heavy, then provided that you use devices sparingly, a much lighter alternative is Anker Powercore II 10000 (6.5 ounces/195 gm)with Anker Powerport 2 PD wall charger. Anker Powercore II 10000 will charge an iPad Pro 10.5 from 0 to 50% once + fully charge an iPhone X once (or it will charge your iPhone X twice). iPad Pros have quite large batteries (~8000 mAh to 11000 mah depending on display size and model year). To charge, both iPad Pro and iPhone X (2700 mah+) regularly for Everest Base Camp trek, we will recommend a 26800 mAH battery. It does weigh a bit (1 pound/450 gm) but it will give you charging flexibility and much needed spare capacity, if required. # The powerbank should be able to get extract maximum battery capacity in lowest time as you may have to sometimes pay by hour and the electricity availability is not assured at all. # The powerbank should be compatible with portable solar chargers. All powerbanks sadly do not go well with solar chargers and hence we recommend only tried/tested powerbanks for solar charging. # It should have some spare capacity in case you cannot get electricity/or adequate sunlight for a day or two. Both RAVPower 26800 PD powerbank and Anker Powercore II 10000 fulfil all these conditions with Anker PowerCore II suited for sparing use and RAVPower 26800 suited for regular use. Yes, you can buy from the given links. # Use the regular USB port (not the USB-C port) to charge iPhone X from a powerbank to extract maximum battery capacity from the powerbank. The reason for this is that USB-C PD charging charges at higher voltage and gives much lower powerbank battery charging efficiency. # Do carry a travel wall charger adapter for Nepal/India AC outlet sockets. # Use dual port wall charger to such as Anker Powerport 2 PD wall charger to charge two devices at once from the AC outlet as AC outlets are in short supply at Everest Base Camp trek teahouses. Anker Powerport 2 PD wall charger charges RAVPower 26800 PD fully in 4 hours from the PD port. It also charges the Anker PowerCore II 10000 in 4 hrs with its fast charging the USB port. Besides this, it will also fast-charge both iPhone X (0 to 50% in 30 mins). # If charging from an AC outlet in a hurry, for the USB-C PD port in RAVPower 26800 PD, set the charging priority as Powerbank followed by iPAd Pro followed by IPhone X. The reason for this is that the bigger battery (powerbank) gets charged at a much faster initial rate than a smaller battery. For example, 30 minutes of charging from PD wall charger will charge your empty battery iPhone X about 50% but same 30 minutes of PD charging will charge your powerbank enough to more than fully charge your iPhone X later. # Again when short on time, charge empty or more discharged batteries first when charging from a wall charger. This is because more deeply discharged batteries get charged at a much faster rate than a battery charged 70-80% or higher. Once phone or powerbank’s batteries reach 70-75% charge, the charging rate drops sharply (about 2x – 3x slower than initial charging rate). For Apple iPhone XS, X, XS Max, iPad Pros charging rate reduces to a trickle after battery reaches 80%. I typically travel with a iPhone X and a new iPad air with retinal display. I would like to be able to fast charge these with a power pack during plane flights (mostly the iPad). I occasionally travel where I might need to charge my phone and iPad and a panasonic camera battery @ least once. Weight is a concern so the lightest solution would be great. I would like to be able to fast charge the power bank also. What would be your suggestion for me? Both iPhone X and iPad Air have quite large batteries and inorder to charge your iPhone X, iPad Air, and a Panasonic camera once (most Panasonic camera batteries fall in the 1000-2000 MAh capacity range) you will require a minimum 20,000 mAH battery. Our top recommendation to meet all your specified requirements is Anker PowerCore 20000 PD portable charger. Anker PowerCore 20000 PD will fast charge bothe your iPhone X and iPad Air and is also future proof enough to fast-charge upcoming iPhone XS and iPad versions as well. It will also itself get fast-charged in just 4 hours with its included wall charger. It is also the lightest 20,000 mAH range PD wall charger (13.6 oz/360gm) as well. So glad I found this guide but I’m still a little unsure on what the best product for me is. And also where to buy from. I’m from Australia and will be travelling to NY for 3-4 weeks at the end of the year with my partner. I have an iPhone X and he will be purchasing the next released iPhone soon. We’d prefer one bank that can charge two phones but one for each phone works too. For Australian readers looking for a powerbank that can fast-charge iPhone X and upcoming Iphone XS, we recommend Zendure A6PD 20000 mAh powerbank (400 grams and 4 full charges for iPhone X) and the RAVPower 26800 PD powerbank (460 grams and 5+ full charges for iPhone X). Both these are available via Amazon Australia. Both these powerbanks can charge two phones at once – one phone at fast-charging speed using USB-C ports and one at regular charging speed using regular USB port. Can you recommend a charger to bring to Disneyland to support an iPhone 8+ and iPhone SE? Thanks! A visit to Disneyland usually involves frequent use of camera and the Disneyland app. The powerbank must also be comfy and handy enough for charging on the go. For iPhone 8+ and iPhone SE, we will suggest a minimum 10,000 mAH powerbank. – For charging one phone at a time at good speed, we recommend the newly released Anker PowerCore 10000 Lite portable charger. This is a slim, light (7.4oz) and handy powerbank. Once charged, the Anker PowerCore 10000 Lite will charge your iPhone 8+ twice + your iphone SE once. its biggest drawback is that it has only one charging port. however, it is an excellent powerbank for holding in the hand with phone for charging on the go while walking around. – For charging both the phones simultaneously, we recommend Anker PowerCore 13000 Compact. This costs almost same as Powercore and also weighs almost the same (8.4 oz). It has the added benefit of 2 charging ports, and will thus allow you to charge both phones simultaneously. It will charge both your iPhone 8+ and iPhone SE twice each. Its drawback is that it is not as slim and handy to hold in hand while charging on the go. Thank you so much! Would you recommend those you mentioned over the PowerCore+ 10050 or the PowerCore Speed 20000 PD? Anker PowerCore+ 10050 is an older, pricier, and heavier (8.4 oz) portable charger model and does not really offer any benefit when compared to PowerCore 10000 Lite or PowerCore 13000 while charging iPhone SE or iPhone 8+. The only benefit of Powercore+ 10050 is that it can be charged in just 4 hrs using a Quickcharge wallcharger while PowerCore 10000 Lite will take about 8 hrs to charge using a 2 Amp wall charger. If you will prefer 4 hr quick charging for your powerbank, then the newer Powercore II 10000 is a far better option offering better gripy design, lower price and lighter weight (6.9 oz). – PowerCore 20000 PD can fast-charge the iPhone 8+ (50% charge in 30 minutes). This will allow you to quickly top-up the iPhone 8 to during rest/lunch breaks. – PowerCore 20000 PD will fast-charge the iPhone 8+ via USB-C port and also simultaneously charge the iPhone SE at fast-speed (about 50% in 50 minutes) via its regular USB port (it has two charging ports). – PowerCore 20000 PD can be recharged in just 4 hours with its included wall charger. – PowerCore 20000 PD is a future-proof portable charger that will offer fastest charge for upcoming near-future iPhones and Android phones. – It can also charge Macbook Air/Pro etc. as well at pretty decent charging speeds. – The included wall charger of PowerCore 20000 PD can be used as a fast-charger for iPhone 8+, allowing you to charge it to 50% in 30 mins. This is useful as buying a good quality separate fast charging Apple wall charger for iPhone 8+ will cost you minimum $30 (Apple sells the fast wall charger for $49). Thanks again for the appreciation and please feel free to send us any further queries! I am struggling to match the US available and AUS available Anker products. Unfortunately through the AU website we don’t have access to all the recent powerbanks. I am travelling through Europe and will need to charge a Samsung S6 and iPhone 6. We are after something light weight, slim and fast charging. Could you recommend a product that’s available through Anker AU? They’re all around the $129-159 mark…very confusing. The prices for Anker products in Australia are unusually high and the available product range is also quite outdated. If you have to absolutely buy Anker only, we recommend the Anker PowerCore 10050 for charging the Samsung S6 and iPhone 6. It gets charged in 4 hours using S6 wall charger and will fast charge both the Samsung S6 and iPhone 6 at maximum supported speeds. Its biggest drawback is that it is not slim (23mm). Fo Australian readers, we highly recommend the slim (14 mm), light, and fast-charging Xiaomi Mi Powerbank2 10000 . Xiaomi is the 3rd largest phone maker in the world and the Mi powerbanks provide excellent quality and value for money. Xiaomi Mi Powerbank2 10000 is pocketable and priced far more reasonably then equivalent Anker powerbanks available in Australia and offers same 4 hour fast charging of the powerbank and fastest speed charging support for Samsung S9, S8, S7, S6 and iPhones. However, please note that we could not find any authorized seller for it on Amazon AU and it is best bought online form Xiaomi Australia/Ausmall – the only authorized seller for Xiamomi in Australia. Excellent write up, very knowledgeable! The mother in law is going to Europe and needs something to charge her phone on the go. She has a iphone 6s and wants something she can have on her person, not necessarily in a backpack. I was thinking maybe a 5000 series or the 6700, or maybe one of the 10000 if its light and small. We will recommend the Anker PowerCore II 6700 (5.1oz or 142 gm) or the newly released Anker PowerCore 10000 Lite (7.44oz or 211gm). Powercore II 6700 will give minimum 2+ full charges to the iPhone 6s at the maximum supported charging speed. PowerCore 10000 Lite will give minimum 3+ full charges to the iPhone 6s at its maximum supported charging speed. Considering your specific use case , any 5000 mAh powerbank is not recommended as the weight/battery capacity/price difference advantages when compared to a 6700 mAh powerbank are negligible. We are also not recommending any of the chunky/fast-charging versions of PowerCore/PowerCore II/PowerCore+ 5000/10000 as these are either cumbersome to handle or have features that are of no use for iPhone 6S. Either PowerCore 10000 Lite or Powercore II 6700 will be a better choice for charging on the go due to their slim & grippy design, light weight, and capability for charging the iPhone 6S from 15% to 100% nearly 3 times (for 6700) or 4 times (for 10000). While travelling, it is not always possible to charge the phone or powerbank every night, and another full day of phone use for extra 60 or so grams (2.2 oz) can be very handy. I’m after some advice please as I’m very confused as to what power bank I should buy! I’m off to New Zealand (from the UK) for six months. During this time my partner and I will be running the length of the two islands – 3,000km in total! We’ll be carrying all our kit so weight is a really important consideration. We need to charge our phones – Apple iPhone SE and a Samsung Galaxy A6. I want to be able to charge both at the same time. At points in the journey we’ll be away from civilization, and therefore the ability to recharge the power bank, for four or five days. So, I need a power bank with a reasonably large capacity without it weighing a ton. What would you recommend please? # It will charge your iPhone SE/Galaxy A6 three times each. This is sufficient for 4-5 days of low-use and using power-saving modes on the phones. # Anker Powercore II 20000 can be fully fast charged in about 5 hours using the standard Samsung Galaxy A6 wall charger. Regular 20000mAh powerbanks will take about 10-12 hrs to charge. The ability to charge and top-up the powerbank is handy while charging in situations such as at the airports or rest-stops while travelling, where you will want to top-up the powerbank with as much power as possible in very short amounts of time. # PowerCore II 20000 weighs just 370 grams (13 oz). This makes it one of the lightest 20000mAH powerbanks around. # Two ports and adequate output capacity means you can charge both devices, even in fast charging mode, at once. # While charging from the powerbank, switch off the fast-charging mode in Samsung Galaxy A6. To do this, go to Settings > Battery > and turn off “Fast cable charging” option. Fast charging uses high voltages and wastes a lot of power. This may be acceptable in the city where a wall outlet is just hours away but absolutely not needed when away on the trail. # Use short and high quality charging cables while charging from the powerbank (max 1 feet long). Long cables will waste precious battery capacity of the powerbank. # Use the Power Saving mode (in “Max” setting) of Samsung Galaxy A6. Galaxy A6 has an AMOLED screen and in max Power Saving mode, the battery life of A6 increases dramatically. This is because the “unused”/dark sections of the screen are switched off in the AMOLED display in the max power saving mode. Incredible site, jam packed with information. Had a question regarding fast charging for iPhone X. I see that the Anker PowerCore Speed 20000 PD has the fastest charging capabilities and generally is the best for my device. However, it can be quite price at about $100. What alternative is there, or next best option is there to fastest charge the iPhone X, at a price around or under $50? Aukey has recently released the Aukey 10000 18-watt USB PD powerbank . As of now, this the lowest cost decent fast-charging powerbank for the iPhone X (or iPhone 8/8+) in the market and it will fast charge (50% in 30 mins) your iPhone X (or iPhone 8/8+) twice. If you also require a fast charging wall charger, you can club it with the excellent Anker Powerport II 49.5 watt dual port Wallcharger. This wall charger will enable you to fast charge the Aukey 10000 18-watt USB PD powerbank in about 4 hours. It will also fast charge the iPhone X/8/8+ as well. Thank you for this article; it was clearly written and even I could understand most of it! However, I like to be safe and so ask for your recommendation for me. I am looking for a power bank I can carry in a light backpack for day trips, to charge an iPad Pro (the 10″) and an iPhone 8 Plus. it needs to be lightweight and capable of charging quickly, please. Thank you. Thanks for the appreciative words! 🙂 For your specific charging requirements, we will highly recommend the Anker PowerCore Speed 20000 PD powerbank. This powerbank will fully charge (0 to 100%) your 10″ iPad Pro once and also fully charge your iPhone 8 Plus twice. Anker PowerCore Speed 20000 PD also supports fast charging for iPhone 8 Plus (50% charge in 30 mins). Anker PowerCore Speed 20000 PD will get fully charged in 4 hours with its bundled wall charger. It is also fairly light at 13 oz (360 grams). Thank you for your prompt reply. One quick question: the Anker site says to buy from Anker because there are fakes on the Amazon site, but when you click on the product, it takes you to Amazon. it does say that it’s provided by Anker, but I thought that was a bit strange. The only authorized seller for Anker products on Amazon is AnkerDirect (which is basically Anker itself selling via Amazon). The links from Anker site as well as all the Amazon links to Anker products from our site take you to only the genuine Anker products sold by AnkerDirect. Hello there.. this was undoubtedly a well informed article. I had a query. I’m using Samsung Note 8 which uses QC 2 to charge itself. Recently i bought a anker powercore.ii 20,000. Will my anker fast charge itself using the charging adapter of note 8! Hi Zubayer, Yes, The Anker PowerCore II 20000 will get fast charged with the stock Samsung Note 8 wall charger. A good choice for Note 8! Waaay too much information for me to understand. Can you help me? We have an iPhone 6Plus and an iPhone X, and an iPad Pro. Which would you recommend? When we’re traveling it’s difficult to keep everything charged. For your specific requirements, we recommend either the Anker PowerCore 26800 PD or the PowerCore Speed 20000 PD powerbanks. – Anker PowerCore 26800 PD will recharge your iPad Pro once and recharge your iPhone 6Plus and the iPhone X twice each at the fastest possible speeds. It comes with a bundled fast charger which will quickly recharge the powerbank in 4.5 hrs. Considering the fact that you have 3 devices, Anker PowerCore 26800 PD seems like a better choice as it has extra battery capacity and one extra charging port. – 9v in for recharging? Your site showed lots of power banks with the features above but I’m having trouble finding one specifying an always on mode. ✔ It has a 20000 mAH capacity as required by you. ✔ It has 2 USB outlets + an adjustable voltage DC barrel port + 120V or 230V (European version) AC output port that can also be used to output 150v or 300v HVDC (European version). ✔ 9 volt in for charging. In fact, you can set output voltage to anything from 1 volt to 24 volt. ✔ And of-course the capability to be on always on mode if you turn off the 5 minute auto-shut off. If the Omnicharge seems too pricey and all you need is plain 5V output, then another honorable mention featuring the always-on mode is the Voltaic Systems V44 Always-On 12,000 mAH External battery charger with 2-USB ports. It comes with a default/factory 20-minute auto shut-off feature that can be disabled by pressing the power button for 5 seconds. On doing this the, portable charger’s LEDs will blink 3 times to indicate that it has now entered the Always On mode. The Voltaic Systems V44 Always-On portable charger also features pass-through charging (charge the powerbank while it charges devices) as well. I have a HP Spectre x360 13’ late 2017 version, MacBook Air 2013 version, an OnePlus 6 and an iPhone 6 Plus. I’m struggling very much which Anker powerbank(s) and cables(Type A/C 2/3/3.1 Gen1/2) would work for these devices I have individually or together…..there are so many many versions of power banks and cables that are so extremely confusing especially I’m using both Mac OS and Windows and both iOS and Android. Could you please kindly suggest me which ones to buy? I’m a student and I especially need a powerbank to charge my HP Spectre x360 13’ If/when power outlet isn’t available at certain places. I don’t live in the US, so those two pin wall chargers won’t work for me. Anker doesn’t seem to sell any UK or Europe adaptor right? I would also like to understand why some powerbanks won’t work on laptops or certain laptops or phones? Does it have to do with Power Delivery? Or those devices like HP laptops are a bit special? Sometimes I read great reviews on certain products but at the bottom it has small prints stating it doesn’t work on HP Spectre or Google Pixel etc. Why some work some don’t? It would be of great help. Thanks so much! Could you please explain why Power Core 13000 is recommended over 13000 C? As far as I know, this is the exact same model except the type-C input. Is there any other difference between these two power banks? Our recommendation is based on the (usually) lower price of PowerCore 13000. Until very recently 13000 C was priced about $5-6 higher. Given that all other features (size, weight, output currents) are the same – even the recharging rate of the two powerbanks is same – USB-C doesn’t offer any advantage other than convenience if you already have a USB-C device. If the two devices are priced same (as they are currently late May 2018) then either of the two portable chargers is as good as another depending on your preference for micro-USB/USB-C input. Many thanks for the reply. So I have settled on the PowerCore Speed 20000 PD with the bundled charger and the Anker 21W Dual USB Solar Charger. Oddly Anker Drect via amazon says it can ship the solar charger to australia but not the 20000PD. Please can you tell me if there is a way round this ? HI there – firstly what a VERY useful and informative page – thank you! Ok so for high altitude trekking I am hoping to avoid some of those recharger fees. However I want to charge Olympus bln-1 camera batteries as well as Galaxy s8. …and weight matters more than cost I think! plus 21w solar dual usb. or maybe Anker elite 20000 because of the 3A output? #1 We will recommend either Anker PowerCore Speed 20000 PD or PowerCore II 20000 for your smartphone camera/combo (Samsung S8, BLN-1 for Olympus OM-D E-M series/PEN E/F series). Both will fast-charge your Samsung S8, get charged in 4-5 hrs, and provide adequate power to charge your BLN-1 camera battery at the same time. Anker PowerCore Speed 20000 PD is a more future proof option and will get fully recharged in 4 hrs with the bundled charger – a plus during travel. PowerCore II 20000 has the advantage of costing much less and its recharge time is practically almost same as PowerCore Speed PD! PowerCore Elite 20000 will not fast-charge your S8, takes much longer to recharge than these two, and its 3 amp max USB output will not be useful for either your phone or your BLN-1 camera battery. #2 The BLN-1 battery does not require high-amps for charging. It is a rather small battery (1220 mAH @ ~ 8 volts) and like most camera batteries, it is designed to be optimally charged slowly at low-amps. A 1-Amp output USB port is maximum you need to charge the BLN-1 over a USB BLN-1 single charger such as the OAproda BLN-1 Micro USB Battery Charger. Even if you use a dual BLN-1 USB charger such as the NewMowa dual BLN-1 USB charger, you will need a max of 2-amps of charging output power and any extra output capacity will simply not be used. All the output ports of Anker PowerCore Speed 20000 PD or PowerCore II 20000 output 2+ amps and will perfectly charge the BLN-1 at max possible speed. Hi there, thanks so much for all the detailed info!! I have one question that keeps bugging me. I am leaving for 2 months of trekking in Patagonia and will often be out and about in the wilderness for around one week before being able to recharge properly. 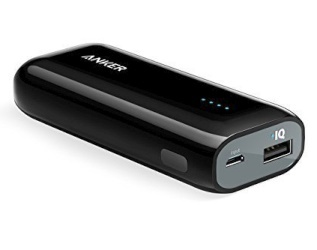 I have a macbook pro (USB-C charged), an olympus camera, phone and possibly gopro to keep charged, so I was thinking of getting the Anker PowerCore Speed 20000 PD and couple it with the Anker PowerPort Solar. Although I am aware that charge from sun is inconsistent and that I won’t be able to always fully recharge my power bank, do you think this makes sense? Does the PD functionality of the power bank interfere with charging from the solar panel? is the solar charge too slow so that this power bank is pointless for me? My thought is that with this power bank I can keep a charge for my macbook and the power bank is more future proof given that probably USB-C devices will become more and more common. Thanks for the query! We will answer your queries one by one. First, the feasibility of a portable solar charger for Patagonia trek. Assuming you are leaving soon, during summer in Patagonia (Nov-Feb) you can expect decent usable sunlight for 14-15 hours due to its high-latitude location. This ample daylight time makes it worthwhile to carry the additional 1 pound or so weight of a portable solar charger on a long-duration trek in the region in the summer. Second, the viability of Anker PowerCore Speed 20000 PD for solar charging. While Anker PowerCore Speed 20000 PD is an excellent powerbank for general use, we DO NOT recommend it for solar charging. The reason for this is that Anker PowerCore Speed 20000 PD charges at its best speed only by using a PD input wall charger (such as the bundled PD wall charger that comes with it). While using a non-PD wall charger, such as a solar charger, the charging speed is extremely slow (0.5 amps maximum charging current). This means that even in the best possible sunlight, you will be able to use only about 20-25% charging current of your portable solar panel for charging the PowerCore Speed 20000 PD. Most portable solar panels such as Anker Powerport 2 solar charger or RAVPower Solar charger can output 2 to 2.4 Amps charging current. We definitely agree that a USB PD wall charger is the way to go to ensure maximum compatibility with the current and upcoming Android/Apple phones. Therefore, we instead recommend RAVPower 26800 30-watt PD portable charger for use with portable solar panels. The RAVPower 26800 30-watt PD can also take non-PD charging input of upto 3 amps maximum. This allows it to be charged at maximum possible speed supported by most portable solar chargers such as Anker Powerport 2 or RAVPower 24 watt solar charger. While RAVPower 26800 30-watt PD portable charger weighs almost 25% more than PowerCore Speed PD it also gives 30% more battery capacity. This additional capacity will be very useful on a long trek as you plan to use a power hungry Macbook Pro. To go with RAVPower 26800 30-watt PD portable charger, we recommend Anker PowerPort II 49.5 watt PD wall charger. This dual port PD output wall charger will allow you to charge the RAVPower 26800 30-watt PD in just 4.5 hours and also allow you to fast charge any modern smartphone as well (including latest iPhone X, 8 etc. and Samsung S9, Note 9 etc. at the same time as you are charging your powerbank. Also, as an aside, if you find the Anker Powerport 2 solar charger out of stock, both RAVPower Solar charger and Aukey 28 watt portable solar charger are good alternatives. Both essentially have same power outputs and durability/reliability (Aukey is rated 28 watt as a marketing gimmick but has same total output of 4.8 amp as the 24 watt RAVpower panel). Thanks so much for the detailed comments and advice! First, if I get the RAVPower 26800 30-watt PD portable charger, can I just use my Macbook charger (Apple 61W USB-C Power Adapter and USB-C Charge Cable) rather than having to add one extra piece of gear? Second, you suggest both the RAWPower Solar Charger and the Aukey 28 watt portable solar chargers as alternatives to the Anker Powerport 2 solar charger, both are quite bigger and heavier than the Anker one, although obviously this means I can get more power out of them, the extra weight and size might become problematic for me (given I am already getting more weight with the power bank). Do you think the Anker solar charger is good enough anyways or not? Basically I need to find the best combination of power bank and solar charger that keeps the weight to a minimum. Maybe there is a solar charger that also has storage capacity that I don’t know of? Yes, you can use your 61 watt Macbook charger to fast charge the RAVPower 26800 PD in about 5 hours. 61 watt Macbook charger supports the PD input charging profiles (20v and 9V) required by the RAVPower 26800 PD. Both build-quality-wise and output-power-quality-wise, Anker PowerPort 2 21-watt solar charger is the best portable solar charger of the three that we are considering, besides also being the lightest (about 18.5oz) as others weigh around 26+ oz. The only reason we suggested the other two as alternatives was if the Anker Powerport 2 is out-of-stock or exorbitantly priced (happens often lately). Also, almost all the usual published weight specs for all these solar chargers are incorrect with real weights being 20-50% more than the published weights. If you can find it in stock, then of course Anker PowerPort 2 is the solar charger to buy. Another great alternative is Anker Powerport Solar 2 Lite (15 watt) at about 14oz. If you cannot find it on Amazon, it is available for direct purchase in the US at official Anker website. At the end of the day, perhaps the best solar charger is the one you can easily carry around, and 15-watt Anker Powerport Solar 2 Lite will offer a decent balance of portability and power output. This 15 watt solar charger will output about 1-2 amp over the day in real world good sunlight conditions and this is adequate to charge the RAVPower 26800 PD about 20%-25% in a 6-8 hour mid-day charging session, which is pretty useful when you are completely off-grid. For maximum charging efficiency and device safety, use short charging cables while charging with a portable solar charger and put your powerbank/phone in the pocket of the solar charger (or cover them with a white cloth). Hi, i have a Samsung s8. I travel a lot in Europe. quick input and quick output would help. which powerbank would you suggest. We recommend Anker PowerCore II Slim 10000 (2+ full charges for Samsung Galaxy S8, S9) or Anker PowerCore II 20000 (4+ full charges for S8, S9). Both these portable chargers can be recharged at max speed using stock Samsung wall charger for S8/S9 and both these powerbanks will recharge S8/S9 at maximum possible charging speed (about 50% charge in 30 mins and full charge in about 90 minutes). Anker PowerCore II Slim 10000 gets full recharged in 4 hours while Anker PowerCore II 20000 gets recharged in about 5 hours using stock Samsung S8/S9 wall charger or any other QC 3.0 wall charger such as Anker 39w dual QC 3.0 wall charger which has dual QC 3.0 ports for fast charging your phone and powerbank simultaneously. I have an iPad Pro 9.7 128GB and and iPhone 7. Which power bank do you recommend? #PowerCore 20100 – PowerCore 20100 will recharge your iPad and iPhone at the fastest possible speed simultaneously. It can be recharged in 10 hours using the standard Apple 12 watt iPad wall charger. # PowerCore II 20000 – PowerCore II 20000 will also recharge your iPad Pro & iphone at fastest possible speed simultaneously. The added advantage offered by PowerCore II 20000 is that it can be recharged in just 5 hours using a QC 3.0 wall charger such as the inexpensive Anker 18W QC 3.0 single port wall charger. Apple 12 watt iPad wall charger will recharge PowerCore II 20000 in about 10 hours. Thank you! Although I do not have any immediate plans to upgrade my iPhone7 or Ipad Pro, would you recommend one over the other if I do? If we have to recommend one, we will definitely recommend the PowerCore II 20000 as for just few bucks more it gives you the tremendous flexibility of fast-charging your powerbank fully in 5 hrs or almost 50% in 90 minutes. In fact, just one hour of fast charging will charge your powerbank enough to charge iPhones 6/7/8 more than 2+ times. The high capacity powerbanks (20,000 mah and above) take a long time to charge with regular chargers (about 10 hrs to charge a non fast-charging 20,000 mAh powerbank with an iPad Pro 12-watt charger). While travelling, a user has lots of things on their mind and it is not always always possible to put the powerbank on charge 10-15 hrs in advance. Also, at airports and rest-stops, you may usually get access to a wall charger for a short period of time and you will want to charge your powerbank as much as possible in that short period. When recharging from empty, fast charge powerbanks get recharged at more than three times the speed of non fast-charging powerbanks. For about $5-8 extra, this is an extremely useful feature to have in a power bank even if your phone itself may not support fast charging. First of all thanks for all this usefull information! 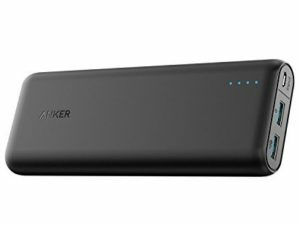 I’m in the market for a powerbank and I love the brand Anker. Currenty I have iPhones (6 & 7), IPads (air, air2 & mini2), and Android devices. Mostly Apple minded and I will continue to upgrade in the future. I would like a powerbank which can charge at least 2 devices at once as fast as possible. Future proof would also be nice. What is my best option? I found the new powercore speed 2000 pd, but It will only charge 1 device. Then I found the powercore + 26800 usb c PD which looked what I was looking for, but its not available anymore on Amazon. It gives a message to buy the powercore 2 2000. It doesn’t look like an outdated model. I think I benefit more by having power IQ over quick charge since I own more apple products. I can’t find the benefits of power IQ2 for Apple devices. Now I’m a bit lost…. Considering your specific requirements, we will recommend Anker PowerCore II 20000. It is one Anker’s latest portable chargers and will easily charge your two iPhones 6/7 as well as 2 iPad airs/minis at fastest possible speed at once. It also gets recharged quite fast (5 hours with a QC 3.0 wall charger such as the Anker 18W QC 3.0 single port wall charger). Anker PowerCore II 20000. also recharges latest Samsung Android phones including Galaxy S9, S8, Note 8 etc. at the fastest possible speed as well thanks to its QC 2.0/18-watt charging output. Will the powecore 2 2000 also be able to fastcharge an IPhone X (i Will upgrade within a month)? Is the powercore + 26800 USB C pd I mentioned an “old” product? Or too much? I’m wondering why you didn’t mention this model (either positive or negative). PowerCore II 20000 will not fast charge iPhone X as it does not support USB PD output. The only Anker powerbanks that support fast charging for iPhone X are PowerCore Speed 20000 PD and PowerCore+ 26800 PD. PowerCore 26800 PD is one of the latest powerbanks from Anker and was released in late 2017. It is an excellent and futureproof powerbank and the only reason I did not mention it was that you had not specifically mentioned iPhone X fast charging requirement in near future and it seemed too steeply priced for charging your current phones (iPhone 6/7), as PowerCore 26800 PD currently costs 140% more than PowerCore II 20000. However, as the PowerCore 26800 PD comes bundled with a 30-watt PD wall charger that also doubles as fast wall charger for the iPhone X, the effective price is about $30 less than list price. Hello. I cannot tell the difference between the Powercore II 10,000 and the Powercore Speed 10,000. I am planning on using it for an iphone 8. PowerCore II 10000 is a 18-watt fast charging (Quickcharge 2.0) powerbank that can also be fast charged in 4 hrs with a Quickcharge wall charger. It supports max charging speed for most Android phones including Samsung Galaxy S9, S8, S7, s6, Note 8, Note 9 etc. PowerCore Speed 10000 is a 24-watt fast charging powerbank (Quickcharge 3.0) best suited for QC 3.0 or QC 2.0 Android smartphones. However, it cannot be fast-charged and takes 6 hrs to recharge. It supports max charging speed for all QC 3.0 Android phones including LG V30, V20, G8, HTC U11, U10 etc. and & all QC 2.0 phones including Samsung Galaxy S9, S8, S7, S6, Note 8, Note 9 etc. For iPhone 8, you are better off purchasing the lower priced PowerCore II 10000 or PowerCore II Slim 10000 (which has same features but is slimmer) as you will not benefit from 24-watt QC 3.0 in PowerCore 10000 Speed. Now in Canada, it’s at the same price so I do not know which one I should buy. I am confused again. If you simply want the best powerbank, then Anker Powercore Speed 20000 PD is easily the best option at present. # Anker Powercore Speed 20000 PD has USB PD which is the most future-proof charging option for the latest iPhone X, 8, 8+ as well as Samsung Galaxy S7/S8/S9 & LG V30/V20 etc. PowerCore II 20000 does not support fastest charging mode of new iPhone X, 8, 8+ (50% in 30 mins). # Anker Powercore Speed 20000 PD gets charged in 4 hours with the bundled wall charger. PowerCore II 20000 takes 5 hours with a QC 3.0 charger – not a big difference but as the price of two is almost same (if you also count wall charger) Anker Powercore Speed 20000 PD is a more sensible choice. # The weight, size and charging speeds of both are almost same. 18 watt USB PD charging is as fast as 18 watt fast charging of PowerCore II 20000 for S9/S8/S7. I own an Iphone 5s. I will upgrade for either Iphone 6/7 or Samsung S7/S7 Edge/S8. Don’t know yet. I know Iphone does not support Qc. But what option is the best/fastest? I want to powerbank to charge fast. At Canadian prices, We will recommend PowerCore II 20000 + RAVPower 30W USB Dual Wall Charger as the better balanced, light-weight & reasonable cost choice. thanks a LOT! Much appreciated! I will follow your advice! I’m looking for a power bank to take on an upcoming trip to China. I have an older phone that is fine generally for me during the day (LG – Nexus 5) but when travelling I will be using it a lot more for directions. I also will be bringing and ipad with us that we might need to charge during the day if we are both searching for stuff online. I will also be upgrading my phone most likely in the next year but not to the best of best phones but one that is a year or two old model (not sure of the make of the phone in the future). We also do a lot of camping so this will come in handy. What would be the best options if I just got something to cover my current needs vs also covering any future needs? I was leaning towards and 20k mah size as I will be carrying it around with me as we walk around on our travels. Considering your unique requirements, we will recommend Anker PowerCore II 20000. This is a essentially a balanced choice – one step up from plain vanilla powerbanks as it offers fast charging/recharging and one step down from the top-end USB C PD portable chargers. Anker PowerCore II 20000 will perfectly support your existing Nexus 5 and any of your future phones (as you will will be buying a 1-2 year old phone next year, we are assuming that you will, at best, buy the top-end Android phones available currently). It also has adequate output to support simultaneous charging of iPad and phone. Anker PowerCore II 20000 is one of the lightest 20000 mAh capacity powerbanks available with an easy to hold ergonomic design and can be fully charged in just 5 hours with any good Quickcharge wall charger such as Anker 39w dual charger. Both the fast charging feature and light weight are extremely useful features to have in a powerbank while travelling. Thanks for the feedback. Any benefit at looking at the one of the newer power banks that have USB-C power input? Would mean faster charging for the power bank I assume (but not something that I really need) and ability to charge any future USB-C devices in the future. Is the trend going towards USB-C on all devices? I’m not all that up on the technology. Also, when looking at the powercore+ 20100 USB-c, It says on Amazon that it comes with USB / USB-c, USB/micro USB, and USB-c /USB-c cables. When I see any of the unboxing videos online only one of them had the usb-c/usb-c cable. Can you verify exactly what comes with this powercore model? I’m leaning towards this model depending on your answer to my earlier question on USB-C use in the future. For $18 more I have that added feature. With either the powercore or powercore+ model I would also get the following wall charger. This would allow me to charge the anker power bank along with one other device. Powercore+ 20100 USB-C comes with a good quality USB-C/USB-C cable & two micro-USB cables. We, however, strongly recommend NOT BUYING the Powercore+ 20100 USB-C. It is an old powerbank that is much heavier (1 pound or 455 gms! i.e. almost 100 gms more heavy), costlier and larger than latest 20000 mAh powerbanks such as PowerCore II 20000 (13 oz or 355 gm) . Also, it cannot fast-charge either new iPhones or new Android smartphones as it uses 15-watt USB-C charging which is 1-2 steps behind what latest phones support. The powerbank itself also can’t be fast-charged as well as it only supports max 12-watt 5v input compared to 18 watt or more on new powerbanks. If you want to go the USB-C PD route for maximum future compatibility, our top pick is PowerCore Speed 20000 PD. Once you factor-in the bundled wall charger, it costs almost same as PowerCore II 20000. While the wall charger you have mentioned is good, it will not fast charge you powerbank/phone simultaneously. The best option we recommend for Powercore II 20000 is Anker QuickCharge 39-watt dual USB charger. It is slightly pricey (around $24 USD), but we have seen many low-cost dual chargers fail to deliver fast charging for two devices at once. The difference in charging times with USB-C PD Input compared to 18-watt fast charge/Quickcharge 2.0 input is about 25-30%. A 30-watt USB-C PD Input 20000mah powerbank such as PowerCore Speed 20000 PD gets charged in about 4 hours. A 18-watt fastcharge input 20000 mah powerbank such as PowerCore II 20000 gets charged in 5 hours. The trend is more towards USB C PD for both Apple & Android powerbanks. However, for all currently available Android smartphones including Samsung S9/S8, Pixel 2, Pixel 2 XL, PowerCore II 20000 is perfectly adequate. A USB C PD powerbank makes more sense if you plan to buy latest Apple iPhones (8 and later), plan to charge Macbooks/Nintendo Switch, or if you want to future-proof your powerbank purchase with the latest available charging tech, especially as the price-difference is not much between the two. The orgnal s7 charger support QC 2.0 OR QC3.0 ? from where i can buy powercore ll in egypt any idea? i bought powercore + 10050i wanna to verify it any idea too? Hi, You can buy original Anker products online in Egypt from Egypt store of Souq.com (Souq.com is an Amazon subsidiary delivering across the Middle East). Besides verifying through verification section of Anker’s own site, you can also verify the product by sending an e-mail to support@anker.com with the unique serial number of your Anker product or powerbank. Thanks! but there is no serial number on my power bank so it”s fake? Hi, which powerbank would you recommend for charging an iPhone 5 and iPhone 6s? I’d like a model with two USB ports so we can charge our phones at the same time, and something that is not too heavy since this will be used for travel purposes. Thank you! Anker PowerCore 13000 Compact – This is the lower priced and lower weight option with weight of just 8.5 oz (240 gm) and has two ports. It is an excellent value for money deal as well as it weighs and costs same as most 10000 mAh powerbanks but has 30% more battery capacity. While Anker PowerCore 13000 Compact is a superb compact powerbank for one iPhone, its only drawback is that it can’t charge your two iPhones (6/5s) at fastest speed simultaneously . Anker PowerCore 13000 Compact will charge two iPhones (6/5s) two times each (total 4 iPhone 7/6/5s charges). The powerbank itself can be recharged in 6 hrs with a 2 amp wall charger. Excellent! Thank you very much for all the useful info. Well done for providing great advice for all of us that are trying to work out the right power bank for our individual needs. I currently have an iphone 5 and will hold onto this for a little while longer. I will also upgrade to one of the newer iphone versions in the near future. I understand that some of the products features wont benefit me on the iphone 5, but I would like to cover myself for the future update of whatever iphone I decide to get next. I am going to do alot of hiking and would like to know the best anker product for me. Could you please narrow it down for me. After considering your specific requirements, we will recommend the new Anker PowerCore Speed 20000 PD powerbank . – It supports 18 watt USB PD fast Charging supported by the new iPhones (iPhone X, 8, 8 plus and upcoming iPhones). USB PD fast charging is a very convenient feature that allows you to charge the new iphones to 50% in just 30 minutes. It is especially convenient while hiking and on the move. – It comes with a high quality 30 watt USB PD wall charger. The stock Apple wall charger that comes with the new iPhones does not deliver fast charging.If you want fast charging, you will either have to buy a much expensive Macbook all charger (29 watt or more) or some other quality PD wall charger.Anker PD wall charger is comparable to Apple’s PD wall charger in quality and costs much less in the Powerbank + charger bundle purchase. – While the price may seem a bit higher at first glance, once you consider the light weight and the wall charger bundle deal, the effective price for Anker PowerCore Speed 20000 PD is same as PowerCore II 20000. PowerCore Speed 20000 PD is a much better portable charger compared to PowerCore II (as PowerCore Speed PD supports USB PD @ 18 watt making it future proof for not only iPhones but also the new/upcoming Androids). – PD input feature of Anker PowerCore Speed 20000 PD enables you to charge the huge powerbank with the supplied wall charger in just 4 hours – much much faster than any other Anker 20000 mAh powerbank. – 20000 mAH is an ideal minimum powerbank capacity for hikes and trekking. Thank you very much for recommending this product. I would have been there for days trying to work all that out. I own a iphone 7 plus i want a power bank that will change my phone at least 3 times. What do you suggest? # It is the lightest 13000 powerbank in market. At just 8.5oz (255 gms) it weighs even less than 10000 mAh powerbanks of other brands. As an added aside, Anker PowerCore 13000 Compact is also the best compact powerbank for Google Pixel, Pixel XL, Pixel 2, Nexus 5/6, and One Plus 5T, 5, 3, 3T. The reason being its support for 5v @ 3 amp charging. Very few compact powerbanks support 5v/3 amp charging. Hi, may I know where can I purchase an Anker Powercore+ 26800 mAH USB C PD in Malaysia? Are you able to advise please? I’m looking to buy a power bank but find all the specs confusing. I need it to charge an iPhone 6s, a 10.5″ iPad pro and a HTC Android phone. I don’t expect to be upgrading any of these any time soon. Would like more than one output as I envisage charging two devices at the same time. Please can you advise which would be best? Go easy – we’re pensioners! Anker PowerCore 20100 – This is our ideal recommended powerbank for you. It has 2 ports and weighs 12.5 oz (about 360gm) and is very well priced as well. It will recharge your ipad pro from 10% to full once and recharge both your phones (iPhone 6S & HTC) from 10% to full twice each. We have excluded powerbanks with too much bulk and features such as Quickcharge/USB-C/PD etc. that you will not necessarily need. PowerCore 20100 can charge any of your two devices at excellent speed simultaneously and is a reliable, robust, easy to carry, and well-priced powerbank. This is a very helpful page you’ve got here – however, I am wondering if you might be able to help me? 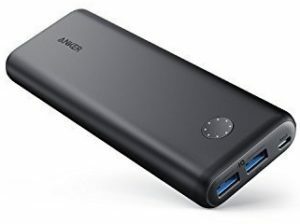 I’m looking on Amazon in the UK, at two possible Anker power bank options – the Anker Astro E1 5200mAh, and the Anker PowerCore 5000mAh – aside from one being 5200mAh & the other 5000mAh, I’m struggling to figure out the difference! All I need is to have something to keep in my rucksack, which can give me a single charge of my Sony Xperia X Compact – just as a backup. Hi, We recommend PowerCore 5000 mAh as it gets charged in half the time of Astro E1 and is also a much more newer version. Another great option, especially for travellers is PowerCore Fusion 5000. It combines wall charger and powerbank in one package, meaning you will have to remember to pack just one item instead of two. Looking at replacing Monkey solar charger/battery that isn’t working out, useless in wilderness hunting. Looking at Anker 21 watt solar and Anker battery pack that will charge off of it very well. Considering 1oooo/20000/26800 and leaning more towards Power Core II 20000 but like size of Slim power core or Power Core II 10000. Have heard not all external batteries can charge off of solar?? What is best combo?? Hi Marc, It is true that not all external batteries can handle solar charging well. However, the good news is that both PowerCore II 20000 and PowerCore Slim 10000 work well with Anker 21 watt solar panel. So I guess it comes down to weight as PowerCore Slim 1000 weighs (and costs) much less (9 oz vs 13 oz) than PowerCore II 20000. – Extra or reserve backup capacity is always handy on the trail. Sunlight supply is often very inconsistent and moreover as solar charging is quite slow, especially when on the move, the reserve battery capacity offered by 20000 mah is always handy when outdoors. – Battery wear due to tens of solar charging cycles during the day will be far less on a 20000 mah battery as it is more likely to remain in the golden 25%-75% battery zone most of the time compared to a 10000 mah battery. – A partially charged 20000 battery will charge faster than a partially charged 10000 mah battery of same remaining charge whenever sunlight becomes available. All of these IMO make Anker PowerCore II 20000 better for solar charging. Sorry for my English. I speak French. Wow, this website is very helpful. I had read everything and spend hours trying to understand how powerbanks work. Right now I have a Iphone SE. So I will need a powerbank to charge a cell phone and a compact camera (I might buy the Canon Powershot SX730 HS 20.3 MP). However I will change my cell phone at the end of the year. I still have no idea if I will keep an Apple cell phone or go with a Samsung Galaxy so I need a versatile powerbank that can be great for both Apple and Androids. Minimum input port that supports at least 2A over 5V. Which of the 20000 powerbank do you suggest??? I am confused with USB-C/Qualcomm/Quick charge. I understand that Qualcomm’s quick charge is only for some smartphones. Not mine. However, do you suggest to take this in case I upgrade for a better Iphone or Galaxy later on? Right now it won’t make any difference if I use this with a Iphone SE, right? It won’t harm my device, but it won’t charge any faster? If I understand correctly, most Anker powerbank are not sold with a USB wall charger (apart from the Anker PowerCore+ 26800 that is way too heavy)? Or is there a great 20000 Anker powerbank that is sold with a fast wall charger? If not, my wall charger is the Apple cube. I think it’s a 1 amp phone wall charger so I guess it’s not providing sufficient power? That means it will not charge quickly enough, right? So do I need to buy a quicker wall charger? Will it make a BIG difference? I am confused… “A 2.4 amp capable wall charger”, as you wrote? Or shall I wait till I buy a newer cell phone, as I read that “new rapid chargers with technology such as Quick Charge support 2 amps. Older iPhones that support only 1 amp can’t be charged faster at all.” I will save some money.. Thank you so much in advance for your time! Much appreciated! Thanks for the query. For current and near future smartphone powerbank requirements, we strongly recommend USB-C PD powerbanks as both latest Android smartphones latest Apple iPhone X, iphone 8/8+ support USB-C PD of about 18 watts. – The powerbank/wallcharger combo is extremely good value for money considering the price of similar powerbanks and wall chargers in the market. – It will even charge Nintendo Switch (18 watt) at maximum charging speed. Besides this, it can also charge Macbooks at decent speed (22.5 watt). Thanks a lot Rabh. Very helpful! I’ve looked at the price of newer smartphones but it might be a bit too expensive for now, so I will probably go for older versions, such as the Galaxy S7 or the Iphone 6 or 6S (for the next 2 years). Right now I only have an Iphone SE and a camera. I know that this phone do not support QC but after reading the reviews here, you all suggest to buy an option with QuickCharge 3.0 Output and input. So I guess I should buy either PowerCore II 20000 or PowerCore Speed 20000 for now? What is the big difference between both options? The big difference between PowerCore II 20000 or PowerCore Speed 20000 is that PowerCore II 20000 supports maximum input/output of 18 watt (roughly equivalent to Quickcharge 2.0) while Powercore Speed supports input/output of 24 watt (Quickcharge 3.0 compatible with max of 12v @ 2 amp). S7/S7 edge do not support QC 3.0 & support a maximum charging current (9v @ 1.67 amp) that is compatible with QC 2.0. For S7/S7 Edge or iPhone 6/6S/7, we will recommend PowerCore II 20000 as it costs few bucks less and supports maximum charging speeds for both Samsung Galaxy S7/S7 edge (9v @ 1.67 amps or QuickCharge 2.0) and iPhone 6S (5v @ 2.4 amp). It will also get charged in a decent time (about 8 hrs) using standard S7 wall charger or 2.4 amp USB wall charger. You can combine it with an Anker QC 3.0 dual port charger. Woww thanks a LOT for your help! Thanks for all the helpful info. I have Samsung A5 2017 and I think I will buy an S7 or S7 Edge in the future …so what do you recommend amongst Anker powerbanks in the 10000 mAh category. Does Anker have a powerbank with USB type c?Thanks!? For Samsung A5 with future upgrade to S7 or S7 Edge, the best option right now among 10000 mah class Anker powerbanks is Anker PowerCore II 10000. PowerCore II supports Quickcharge 2 charging used by Samsung S7/S7 Edge & A5 & you also get the benefit of fast charging of the powerbank charger. If I choose a phone other than Samsung Galaxy S7 or S7 Edge, will it still be a good idea to get Anker PowerCore II 10000? Yes…PowerCore II 10000 & PowerCore II Slim 10000 are the most recommended powerbanks in 10000 mah category even for non-S7/S8 phones. Both offer 5 volt @ 3 amp fast charging, Quickcharge 3.0/2.0 compatible fast charging, & fast charging for the powerbank itself in 4 hours using Quickcharge wall chargers. Both are similar with a maximum charging output of 18 watt with the difference being that PowerCore II 10000 is much lighter and compact and hence costs more. THANK you for this article. I’ve been looking for a comprehensive look at Anker. I’m a long distance backpacker and have been using a Dizaul Solar Charger,Dizaul 5000mAh. I’m not happy with the 5000mAh as it seems very inaccurate…and the solar part does little to nothing. I’ve looked far and wide for another similar system that carries 5000-10000mAh with a solar recharge capability…but have found nothing that fits or I trust. This leads me to a reliable battery only option instead. I’m looking for something that gives me between 3-6 recharges (I’m out for 2-6 days at a time) and something that is as LIGHT as possible. I have an IPhone 7 and don’t need multiple ports. I only need to charge my phone and will only use 50% of the battery at most daily. Is the PowerCore 13000 my best bet at 8.47 oz and very few extras?? PowerCore 13000 is indeed seems to be the best choice with your specific requirements regarding weight. You can also consider RAVPower 16750 as well as it weighs just 2.2 oz more (10.7 oz) and will give you about 1.5 charges more than PowerCore 13000 (6 full charges of iPhone 7). PS. Apologies for the delayed reply due to a bug in our anti-spam plugin blocking a lot of the genuine comments. As both of these phones support a maximum of 2 amp charging, you need not buy expensive powerbanks with Quickcharge etc. Both of these offer excellent value for money with PowerCore 10000 being the smallest powerbank and PowerCore 13000 being the best option if you need a powerbank with 2 ports. If you ever upgrade your phones, both of them will continue charging even the latest phones at pretty fast charging speeds as they are capable of charging at up to 2.4 amps (PowerCore 10000) & 3 amps (PowerCore 13000). Can I ask for advice, am planning a 3 week trek. I will need to regularly charge a Usb battery charger for my canon Eos m5 batteries, my Samsung phone, a kindle and a gopro. What is the best power bank setup, ideally I want to avoid paying to charge when staying at trekking lodges. Shall I go for high capacity? Or low weight, low capacity coupled with an anker solar panel. So we have about 6700 mah of approximate theoretical battery requirement in a day. Taking into account various voltage/conversion losses etc. a realistic rough estimate will be about 9,000 mAH+ a day. At this rate of battery consumption, a high capacity 26,800mah powerbank will last you about 3 days. As far as a solar panel is concerned, its charging capacity will depend on how sunny the place is where you will be trekking as well as altitude/latitude/hours facing direct sun/ambient temperature/shade of trees etc. A high-efficiency 21-watt solar pack such as Anker 21 w dual USB will realistically generate about 6000-7000 mAH in 6-7 hrs of direct winter sun in a day assuming you are in lower-US or central/southern Europe. On the trail, it is best to assume that the charging rate will be half of this – about 3000mah a day. Thus a solar charger will enable you to top-up the high-capacity 26800 charger and increase its use to about 4-5 days. #1 We recommend a no-frills high capacity 26800mah powerbank with dual-input charging for rapid overnight charging from a wall charger whenever available and fast dual charging from solar panel, should you choose one. Both these weigh a pound each. #2 It is a good idea to have an additional small backup charger with you – minimum 10,000 mah is fine. 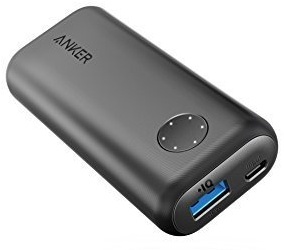 Good choices are Anker PowerCore II 10000 (//Pros: 7-oz/200gms weight, QC 2.0 charging for Samsung //Cons: Costs about $13 more than RAVpower, one port only) or RAVpower 10000 (//Pros: Inexpensive, 2 charging ports //Cons: Weighs 2oz/60 gm more, no Quickcharging for Samsung phone) . – You are better off capturing as much sun as possible everytime you come out of the shade while walking (or in low winter sun). Bigger solar panels are better for this. I’m looking for an Anker 26800 for my iPhone 6s Pluse and my iPad Pro 12.9″ 2017. On Amazon (UK) I find Anker PowerCore+ 26800 PD (AK-A1375011) at 70 UKP , a PowerCore+ with Quick Charge 3 (AK-A1374011) at 90 UKP, and a Power Core (no plus) witgh Dual Input (AK-A1277021) as 120 UKP. I am looking for a recommendation on which Anker PowerBank I should invest in. I am going to be doing a bit of traveling soon, and I will need a portable charger since I will mainly be out and about (rather than near an outlet). The phone that will be used with this powerbank will be an iPhone 7 and iPhone 6. Also, I have a Sony HX80 camera that charges via USB (so I am hoping that an Anker powerbank could work for that). I hope you can help me with choosing a powerbank! Thanks! Hi Lydia, Thanks for the query. We will recommend a minimum 20000 mAH powerbank for travel and charging 3 devices. As iPhones do not use Quickcharge or USB-C, you can select from less expensive power banks that do not have Quickcharge or USB-C. However, a powerbank with Quickcharge Input (or any other fast charging input) will give you the benefit of quickly recharging the powerbank in about 5-6 hrs whenever you have access to a wall outlet as compared to the 12-13 hrs taken to usually recharge such massive capacity powerbanks. Based on your unique use-profile, we highly recommend Anker PowerCore II 20000 and Anker PowerCore 26800 power banks. Anker PowerCore II 20000 offers best value for money while Anker PowerCore 26800 offers the maximum TSA-allowed battery capacity, though at a price premium. Both these powerbanks have dual input and will get recharged in under 6 hours via a 2.4 amp capable wall charger. Both these powerbanks have 3 output ports with max 6 amp output, meaning you can charge both your iphones and the camera at their maximum charging speeds simultaneously from the powerbank! If you intend to charge all your 3 devices and the dual input powerbank simultaneously using a wall charger, you will require 5 USB ports all capable of 2 amp+ output. For this, we will recommend using heavy duty 4-6 port wall chargers with 50 watt+ capacity such as the RAVPower 60W 12A 6-Port USB Charger or Anker Powerport 6 60w 12A 6-port charger. Both of these will recharge all the 4 devices (2 iPhones, camera, and the dual input powerbank) simulataneously at their maximum possible charging capacity. I’m considering different models of Anker but not sure which one to go for or where to get it from specially that I can no more order it from Amazon US and get it shipped to Bahrain. If you can please help me with your suggestions, I’m looking for one that support fast charging facility and can charge my Samsung Note5 for 2-3 times, need this for outdoor hence light weight is an advantage. I’m also not sure where to get it from. I found a shop selling them but the description at the bottom was in Chinese and the prices were very low so I thought they might be fake ones. Hi Lamees, If you are in Bahrain, you can buy genuine Anker, RAVPower, Xiaomi, Aukey powerbanks online from Souq.com. Here is the link to their Anker products store. Souq.com is now owned by Amazon and ships to Bahrain (as well as Qatar, Oman, and Quwait besides UAE). If you want the maximum external battery capacity at the lowest cost and do not need the Quickcharge capability, buy an Anker PowerCore 15600 or Anker PowerCore 20000. However, if you need a good capacity portable charger with Quickcharge at minimum cost that can charge your Quickcharge capable phone quickly (80% in half-hour), then buy an Anker PowerCore Speed 10000 QC. Thanks for this article! great help! Just wondering if you could explain what the mAH units mean and what the implication means for me as an end user of choosing one of a lower/higher value? And what does input/output only mean? Mah is a measure of battery capacity. To put it simply, the more the MaH value, the longer will your powerbank last. So a 10,000 mAH powerbank will fully charge a smartphone with ~2000 mAH battery iPhone 7 about 3.5 times while a 20,000 powerbank will charge it around 7 times. Input only means that the charging technology or standard mentioned (like Quickcharge) is only for charging the powerbank and NOT for charging devices using the powerbank. Output only means that the charging technology mentioned is used only while charging the devices from the powerbank but NOT when you are charging the powerbank itself using quickcharger. Our recommendation is to of course go for both Input/Output powerbanks. However, QuickCharge or USB-C Output only powerbanks are a good low-cost option if you intend to just charge your devices quickly and do not mind slow (7-14 hrs) charging times for the powerbanks. A very good example is Anker PowerCore 20000 with QC 3.0 output only which offers huge capacity and superfast charging for your smartphones at a bargain price. We do not exactly recommend input only powerbanks as you will always find a nice Output only or Input/output powerbank for every budget. I’m considering getting the Anker PowerCore 20100 as that looks like it offers high-speed input and output charging with a relatively substantial mAh. I’m sure it’ll suffice for my Samsung Galaxy S5 + one or two older models which my parents have that we hope to charge while out on holiday in the middle of nowhere. Just wondering if you recommend stepping up the purchase to the Anker PowerCore+ 20100 USB-C for an extra £10 (~$14 USD) more? From what I understand USB-C will only benefit the very latest phone models and others in the future. So would it be worth future-proofing myself? And is the prime advantage of USB-C a faster device charge rate? And while not intended for it, I take it given the ubquity of the mini-USB to USB port charging offered by such power banks, I can then use the cables to charge other devices such as my digital cameras or other devices. Thanks for the response and queries. Yes, we will definitely recommend going for a USB-C powerbank at present to futureproof any powerbank purchase as USB-C is fast becoming the standard for Android due to support for it by Google. USB-C does not always provide faster charging time over other rapid charging standards – it mostly depends on the particular charging voltage/current supported by the device. But for most upcoming devices (such as Galaxy S8), it will generally offer equivalent or faster charging times. Other big advantages of USB-C is its versatility (you can charge smartphones, most latest and upcoming laptops including Macbooks, and even other devices such as Nintendo switch) and two way charging connectivity (your phone can act as powerbank for other devices). While shopping for USB-C powerbanks, we recommend choosing a powerbank with highest total wattage output in your budget as, in the case of USB-C, higher output wattage implies higher charging speed for supporting devices. For example, both Anker 20100 USB-C and RAVPower 20100 USB-C offer 15 watt output. RAVPower 20100 USB-C PD or RAVPower 20100 USB-C PD offer 30 watt and can charge a Macbook (or a supporting phone or Nintendo Switch) at twice the speed of a 15-watt powerbank. USB-C output wattage can theoretically range up to 100 watts!! (no such USB-C powerbanks or devices exist at present!) and in future this will enable USB-C to charge larger and more powerful appliances and peripherals. To summarize, both Anker 20100 USB-C and RAVPower 20100 USB-C are excellent choices. RAVpower 20100 USB-C costs a bit lower than Anker and also comes with support for Quickcharge 3.0, which is useful if you or your family owns many/any Quickcharge 3/2/1 devices Galaxy S5 does not have support Quickcharge). Yes, Ayan. Souq.com is a good place to buy Anker powerbanks. In fact, Souq is now an Amazon-owned site as Amazon recently acquired Souq.com. You can even log into Souq.com using your Amazon username/password. My old E1 has packed up, so looking to replace with an equivalent, I use it mainly to run my Mobius camera from a bike bar bag. It has worked excellently for quite a few years. Should I just get a direct E1 replacement or the 2nd Gen or the new powercore slim 5000 both of which are around £5 dearer? We recommend getting an Anker PowerCore Slim 5000. The advantage of Powercore slim over E1 is that Powercore Slim will get recharged in less than half the time (3.5 hrs) taken by E1 using a 2.4 amp wall charger such as Anker 12W USB wall charger Wall Charger. Tip: To prolong life of your powerbank, please charge and discharge it at least once every 3-4 months. Thank you for your quick reply, I was kinda tempted with the 5000 slim as the bar bag is tall and long. However, you have thrown a spanner in the works with a review for the powercore 10000. With slightly different dimensions would this represent better value for money @ £20? What is the best way to charge a power bank? I’ve had my 10050 on the basic phone wall charger for 5 hours and it hasn’t moved. First recharges for most powerbanks can be very frustrating as they take extremely long on basic .5 to 1 amp phone wall chargers. For first charge of a 10050 mAH powerbank on a basic .5 amp wall charger, make sure u pressed on button on the powerbank after connecting….and wait 20-24 hours! Slowly, slowly, one after other the blinking lights will progress with full charge in a maximum of 24 hours. If there is still no progress after 24 hours of non-stop charging, you should consider raising a replacement/return request. 10000 mAH is 10 Ampere-hours so at the rate of .5 amperes (supplying .5 amp-hrs per hour) afrom the basic charger it will take about 20 hrs to charge in theory. After factoring in conversion efficiency of about 90%, it is more like about 24 hours in practice. For 20000 mah and more, just double/multiply the time accordingly (48-72hrs!). Do not worry, as all subsequent/later charges will take far lesser time even when using the same wall charger. Looong charging times for high-capacity powerbanks are one big reason to go for quicker charging USB-C input or Quickcharge 3.0 input powerbanks and USB-C/QC 3.0 wall chargers. Very helpful web page. For a Samsung S7 edge, is this not compatible with quick charge 3.0? What would you recommend? Some such recommeded powerbanks with QC 3.0 Input/Output are: Anker PowerCore+ 10050 QC3.0, Anker PowerCore+ 26800 QC 3.0 and RAVPower 20100 QC 3.0/USB-C. The RAVpower 20100 QC3/USB-C is our favorite pick as it also comes with USB-C input/output charging making it very versatile for charging future smartphones and even laptops/ultrabooks. Hi…i purchase 20100 anker power bank online. Any specific details to check if I purchased a fake one? Hi Maria, If you have purchased from Amazon, then make sure that you have purchased from AnkerDirect the only authorized Anker product seller on Amazon. Other than Amazon, in the US, the only other major authorized online sellers for Anker powerbanks are Staples, Newegg, and RadioShack. To be on the safe side, it is better to purchase only from these sellers. One way to know if your product is genuine is to call Anker support at +1 (800) 988 7973 (in US) or at +44 (0) 1604 936 200 (in UK) and enquire about the warranty by giving your order no or other proof of purchase to the customer care representative. Looking to power a Garmin Edge 1000 gps unit during a long (18-hour-non-stop) bicycle ride – any advice as to features / capacity I should be looking for? Thanks! The good news is that Garmin GPS 1000 is not a very power hungry device (compared to smartphones), and hence a low-cost good 10000 mAH powerbank should be more than adequate to power it for 18-hours of screen time. If you ONLY plan to power the Garmin 1000 and not your phone you can skip the QuickCharge powerbanks. However, we recommend to go with a minimum 10000 mAH powerbank with Quickcharge and with 2 ports so that you can charge your phone (if required) and Garmin 1000 at the same time. Another important factor for outdoor use is that it is recomended that your powerbank is waterproof and shock/dust proof Our recommended powerbank with all the above features is RAVPower 10050mAh Outdoor Portable Charger . It is priced well, has two ports, and is rugged enough for outdoor/biking use. In Qatar, you can buy genuine Anker products from Souq.com. To avoid purchasing fake/counterfeit products, it is best to avoid small shops for buying such products and better to go with large chains such as Souq. I only have apple products (iPhone 5, 6s, and 2 iPad’s), I wouldn’t benefit from QualComm Quick Charging (ASIN: B00VLNT9KW) when charging my devices, correct? I could however benefit in that the Anker itself would charge up faster if connected to a Qualcomm fast charging brick, correct? But none of the apple devices’ power bricks nor the devices themselves would benefit from QC2.0 nor QC3.0, correct? Yes, You are correct! Apple products (as of now) will not benefit from Quickcharge 2 or 3 in Anker 200000 with QC 3.0. Also as the powerbank you mentioned (Anker 200000 with QC 3.0, ASIN: B00VLNT9KW) is Quickcharge output only , you will not benefit from the powerbank charging quickly as the powerbank will get charged in the normal time only. 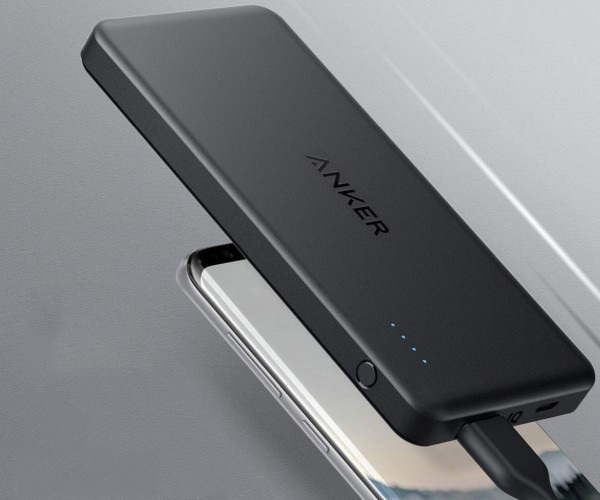 We suggest you opt for the older and lower-cost Anker Powercore 20000 (without QC 3.0) if you do not plan to buy any non-Apple products in near future. It will also charge your iPhone at twice the standard charging speed and the iPad to its maximum possible charging speed at 2.1 Amp. Apple-supplied iPhone chargers only charge at 1 Amp and hence the high-amp output will cut charging times for iPhones by about half. We also suggest using (or buying if you do not have one) a 2.1 Amp+ wall charger such as the RAVPower 24 W 2.4 Amp dual USB charger for charging the powerbank at it maximum possible rate – about 10 hours for a full recharge.